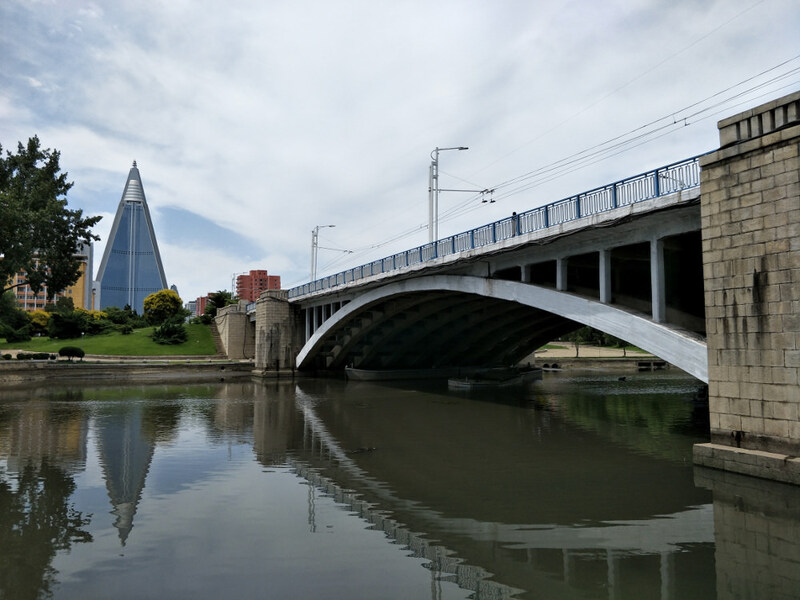 The next bridge south down the Taedong River is the eponymous Taedong Bridge (대동강다리). 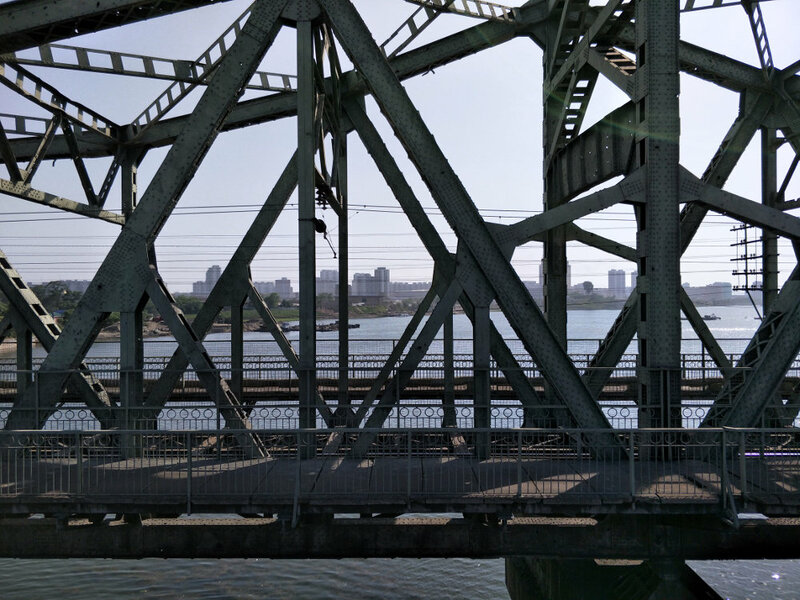 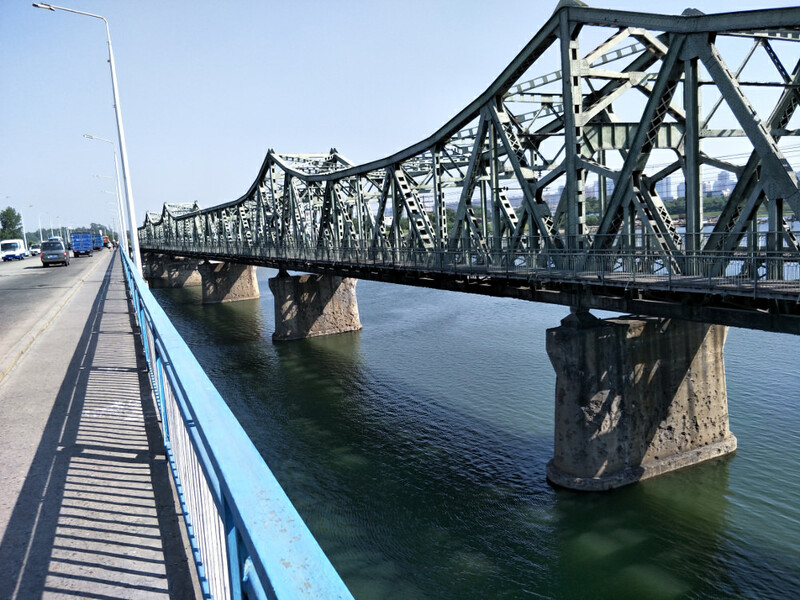 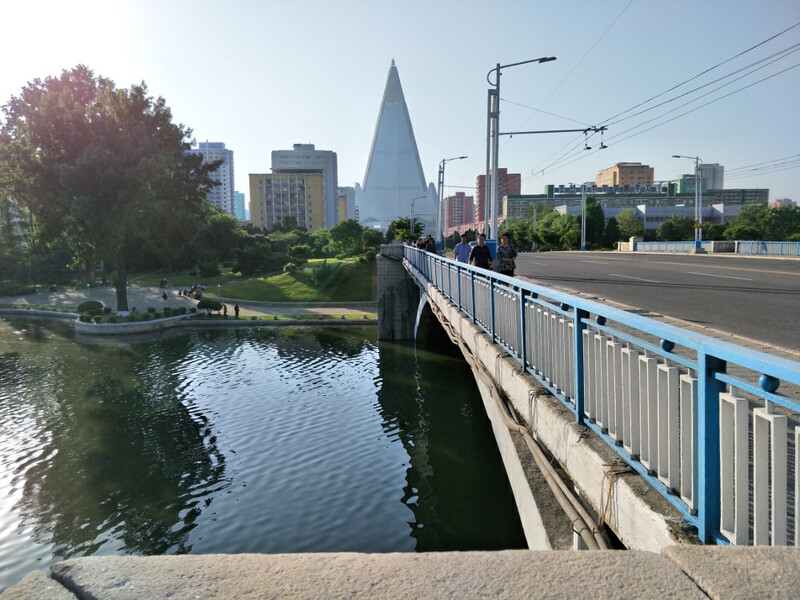 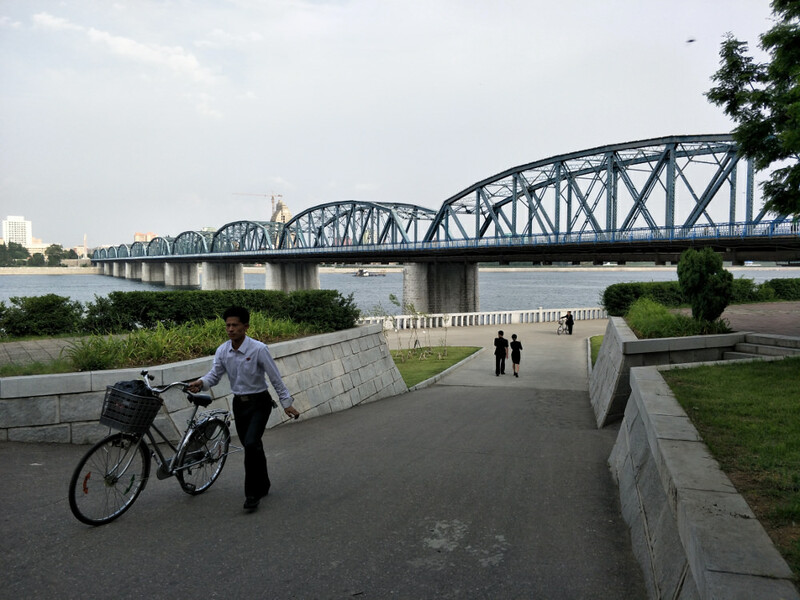 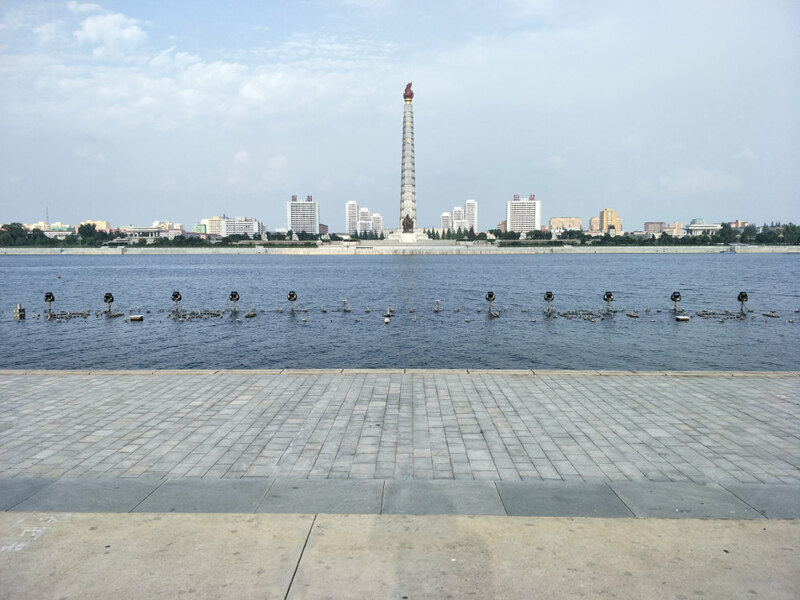 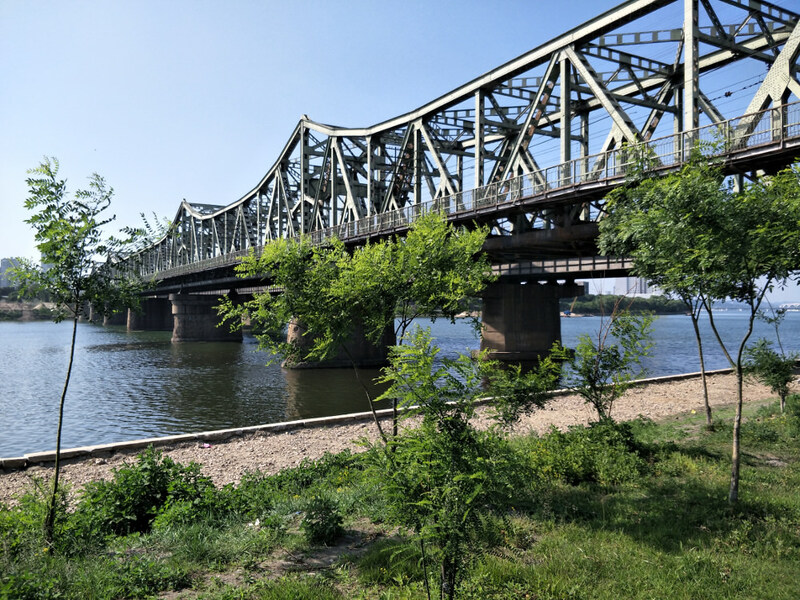 It is located on the other side of Kim Il Sung Square and the Juche Tower to Okryu Bridge (the two bridges are an equidistant from the central axis that cuts through Kim Il Sung Square and leads to the Juche Tower). 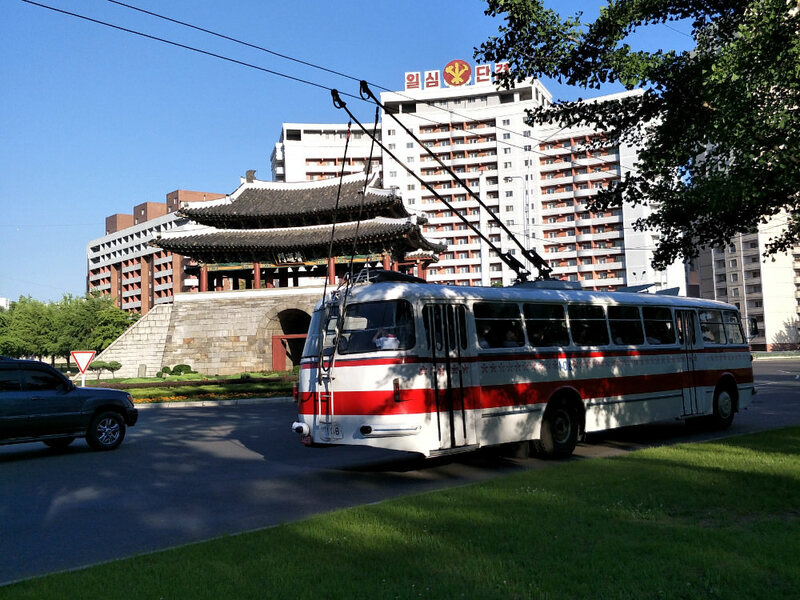 It was built in the 1920s by the Japanese imperial government which ruled Korea as a colony at the time. 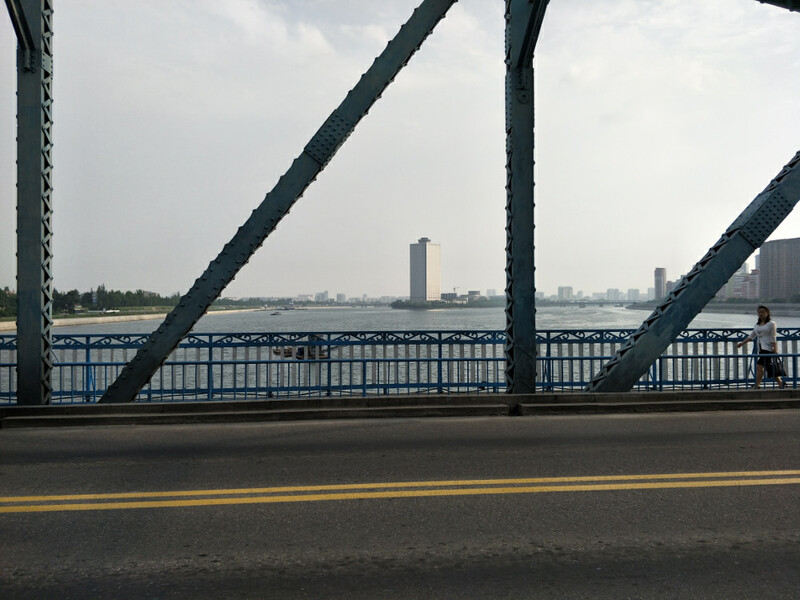 The next bridge to the south is the Yanggak Bridge (양각다리). 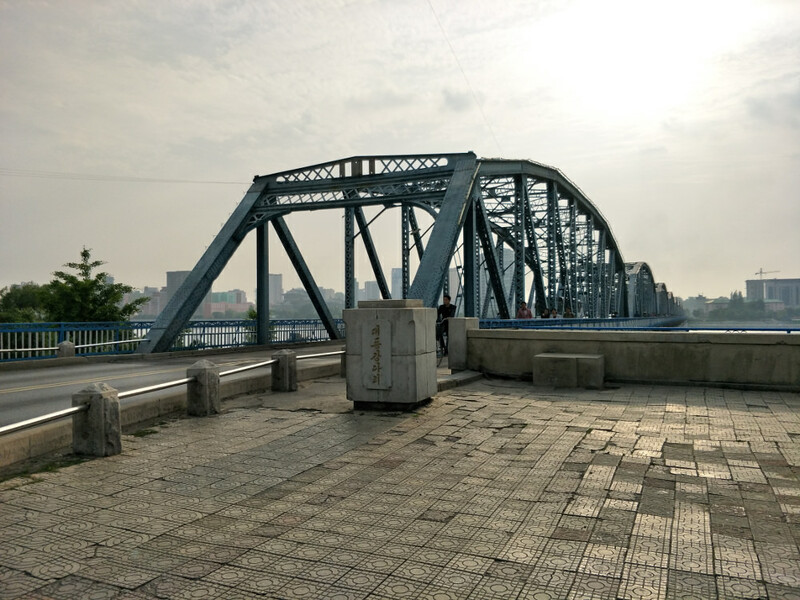 This is the bridge that provides access to Yanggak Island, where the Yanggak Island International Hotel, the hotel where most foreign tourists stay, is located. 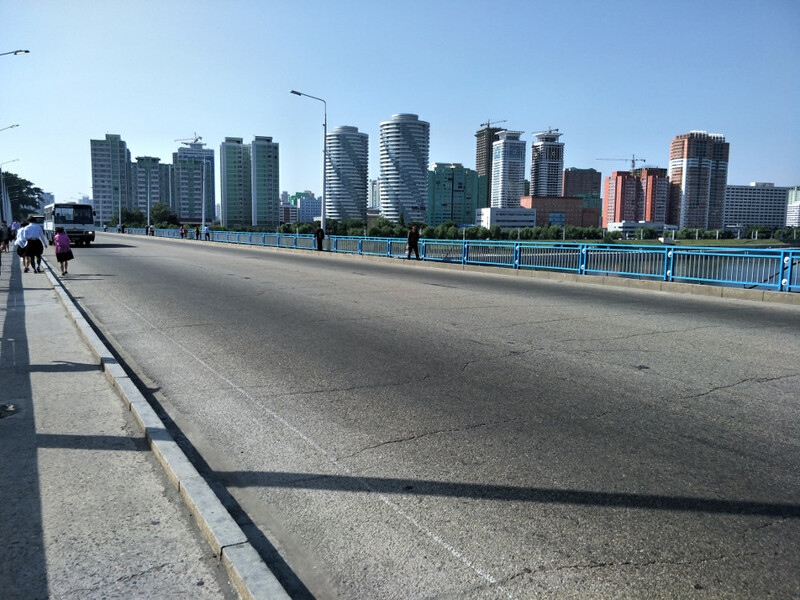 After crossing this bridge from the east bank of the Taedong River, I ended up near Mirae Scientist’s Street. 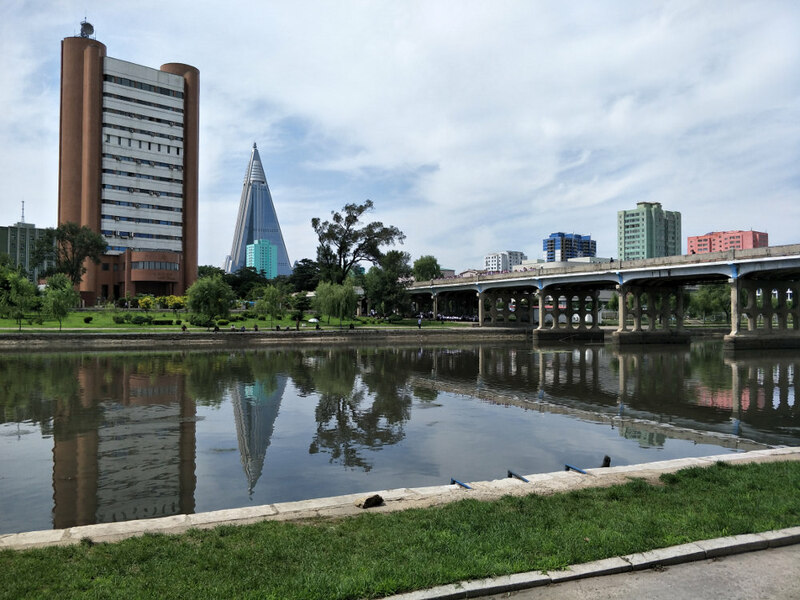 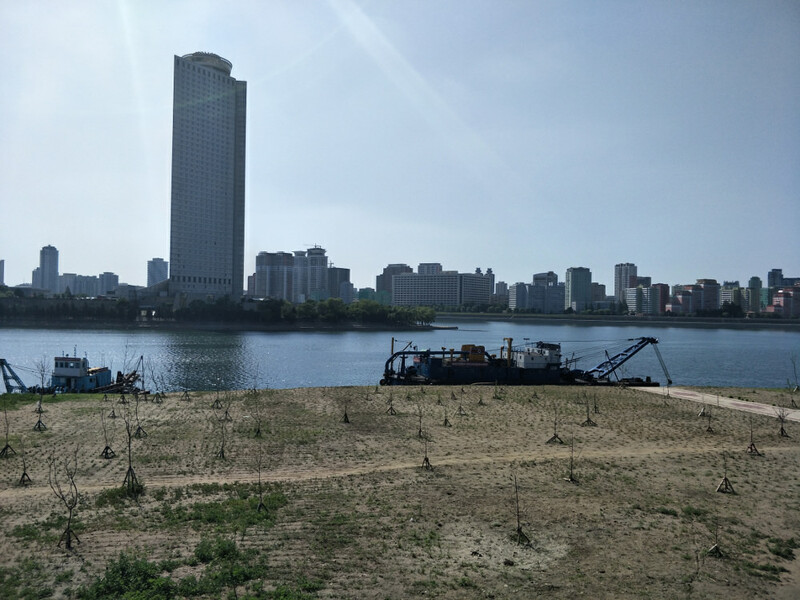 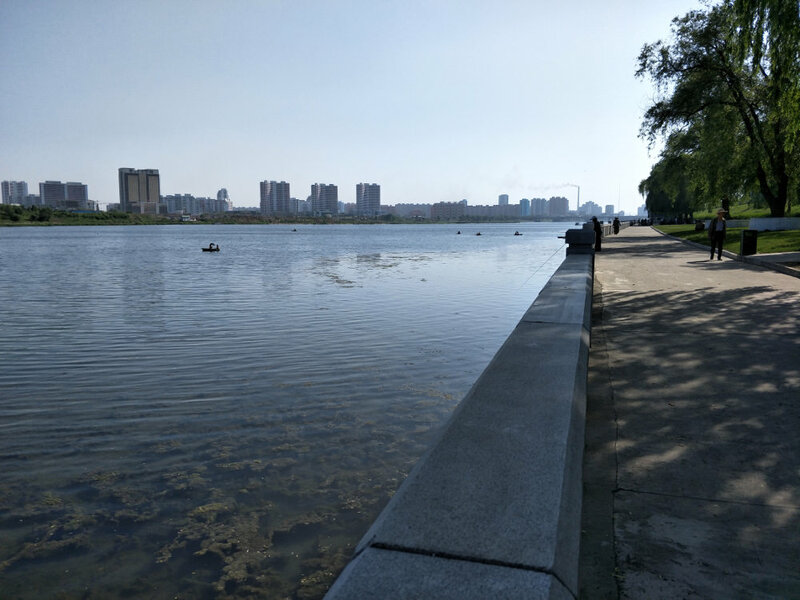 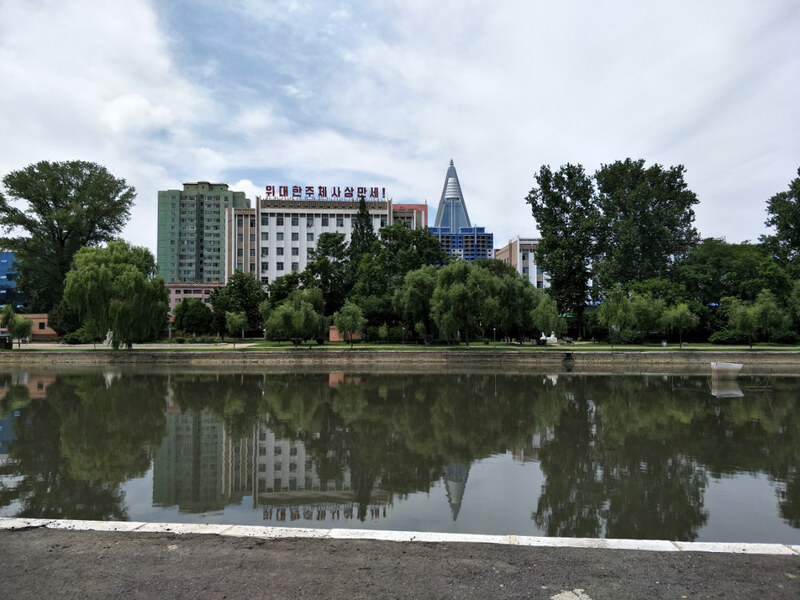 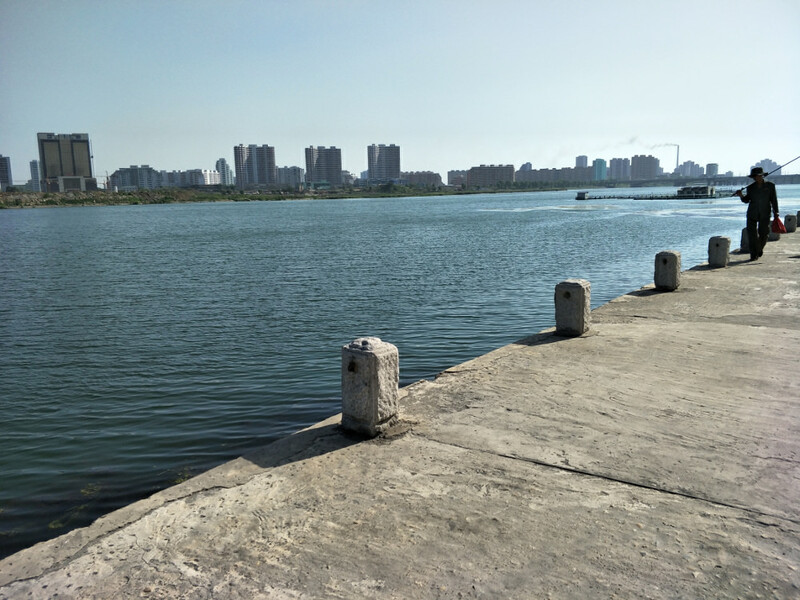 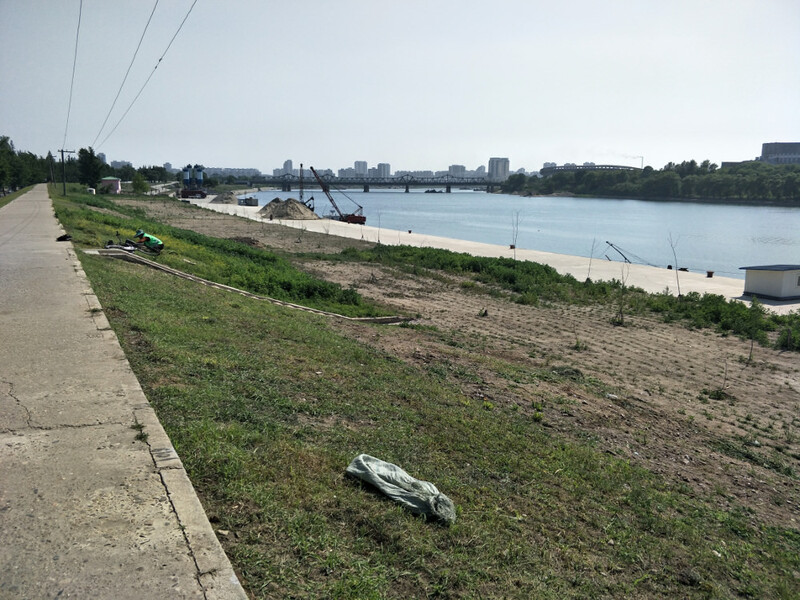 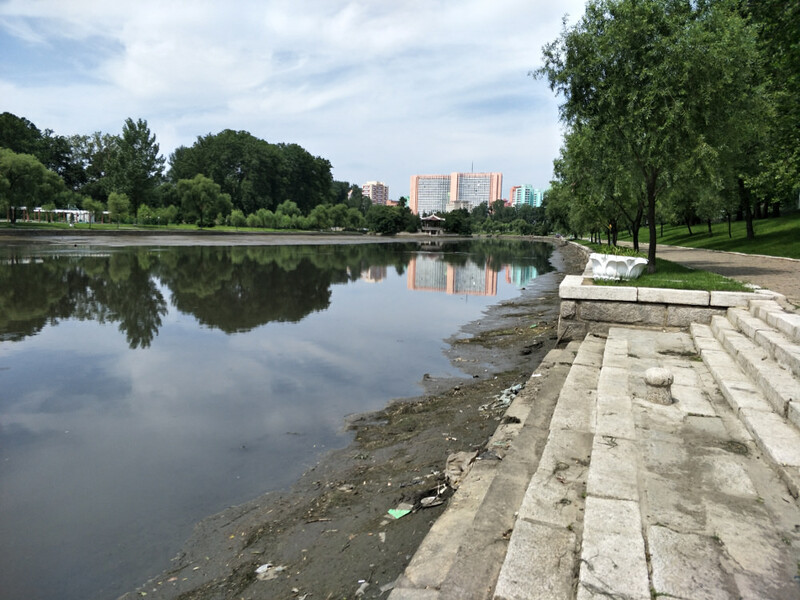 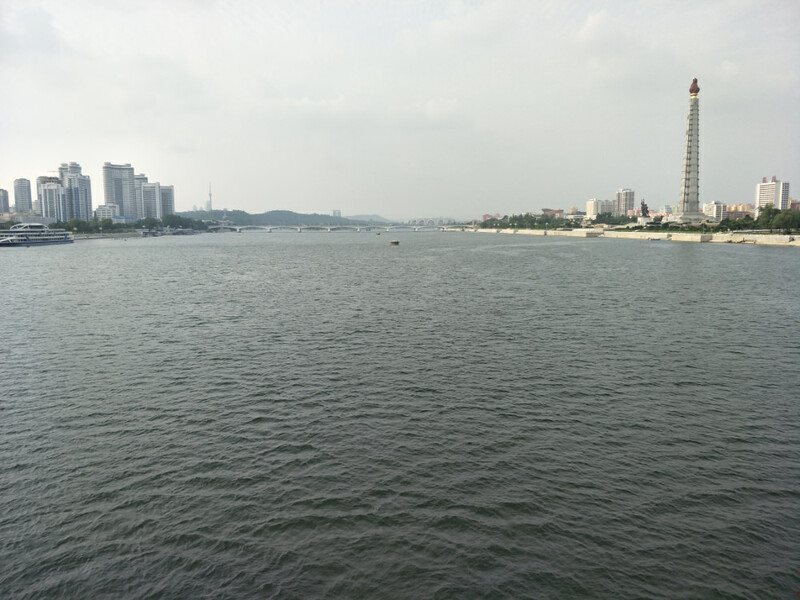 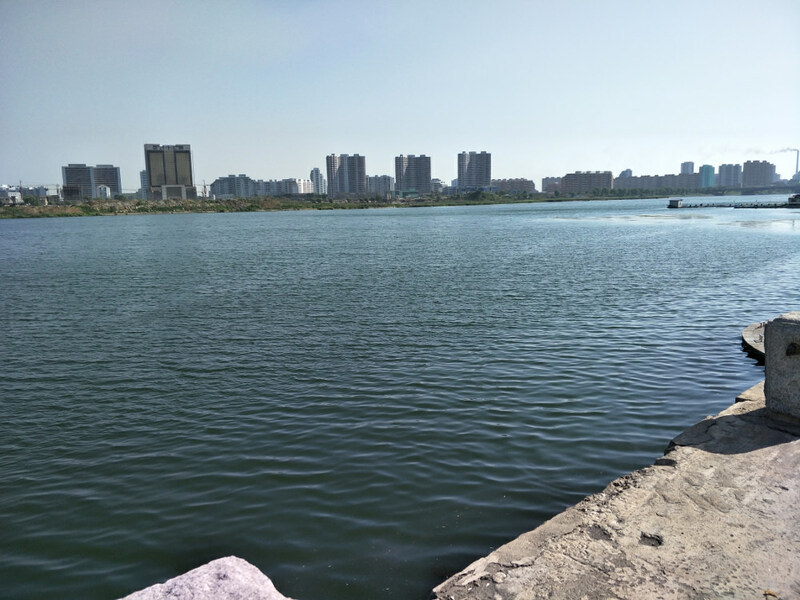 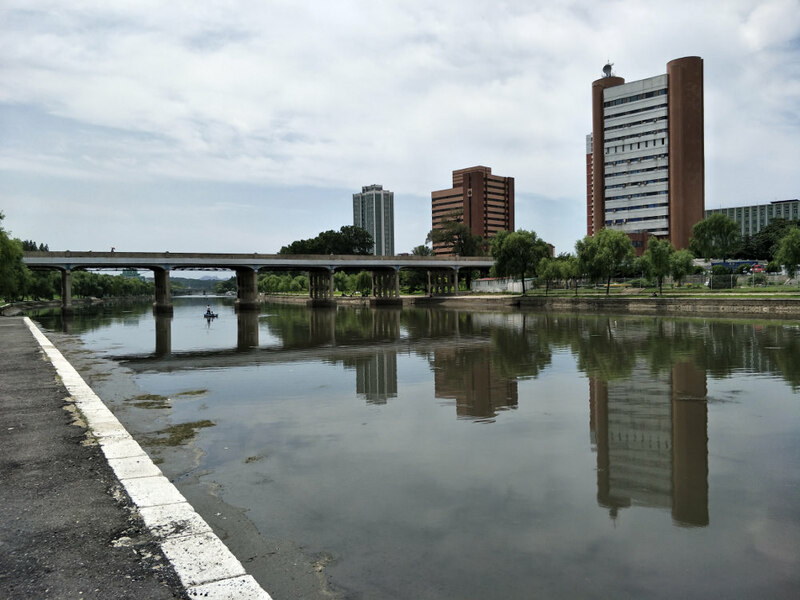 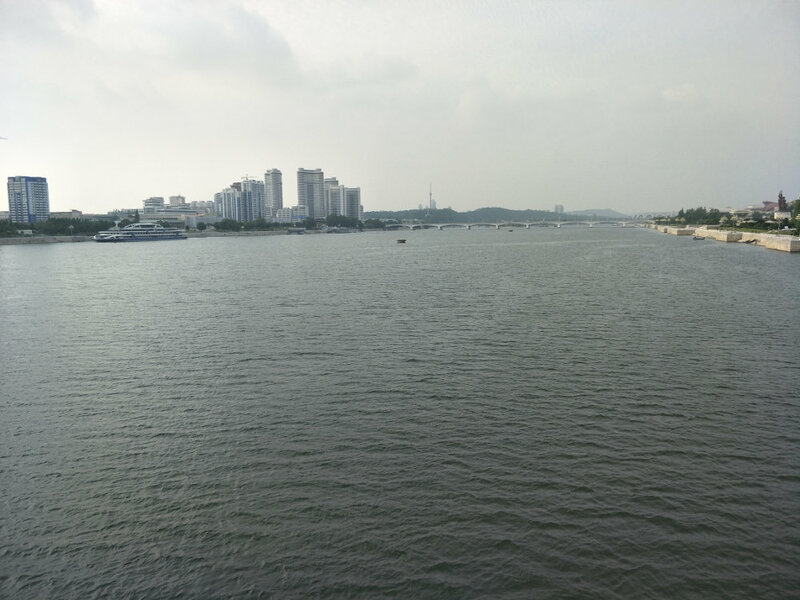 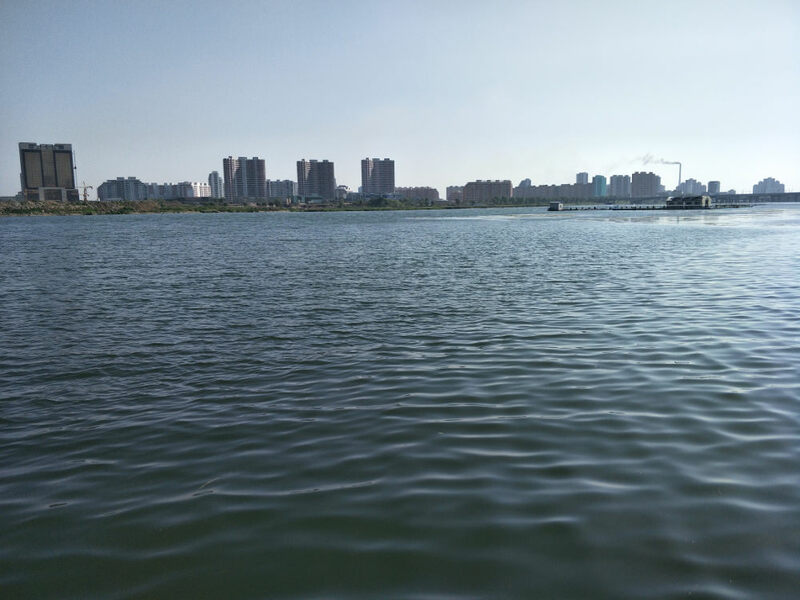 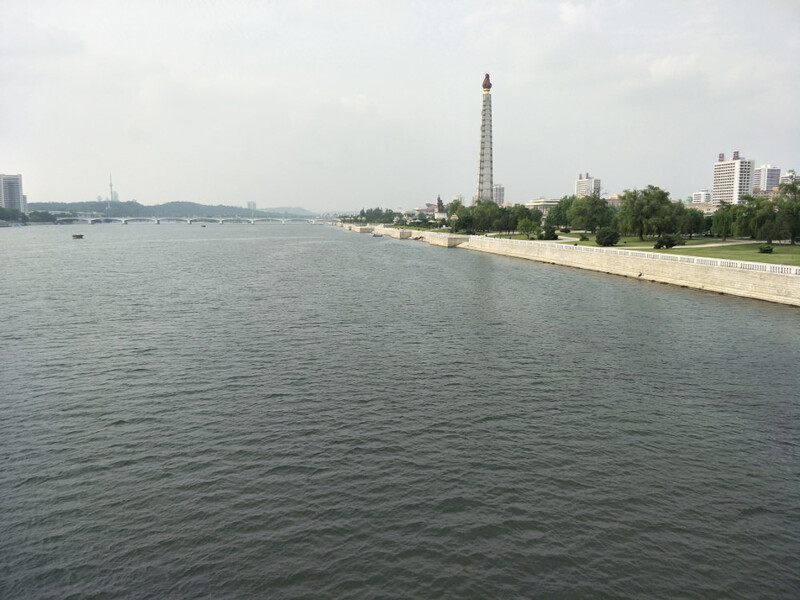 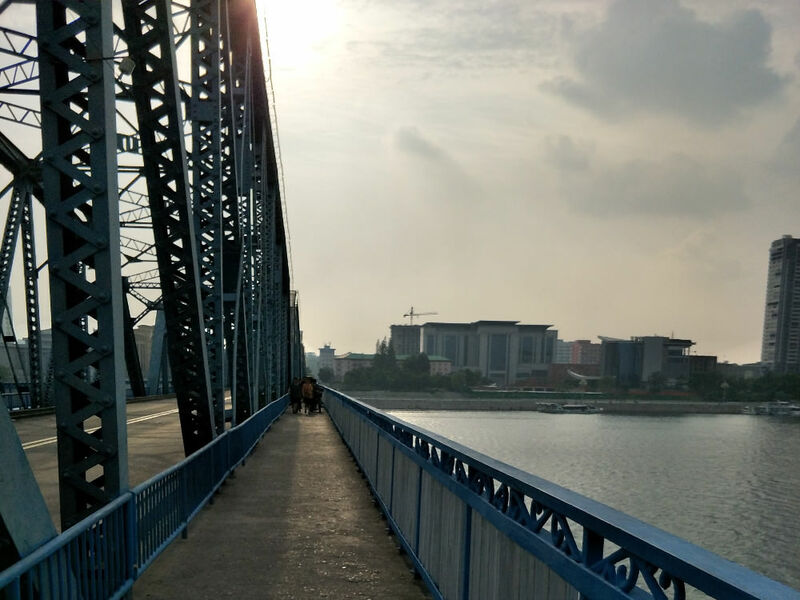 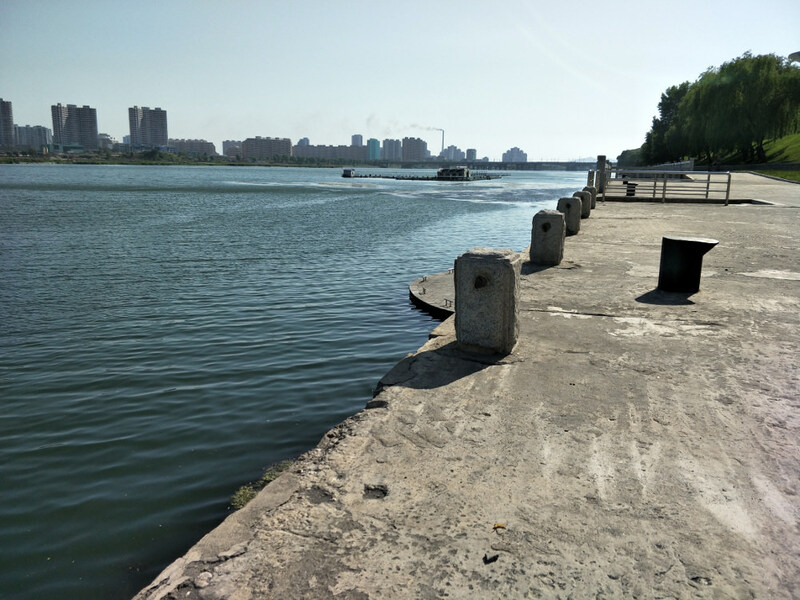 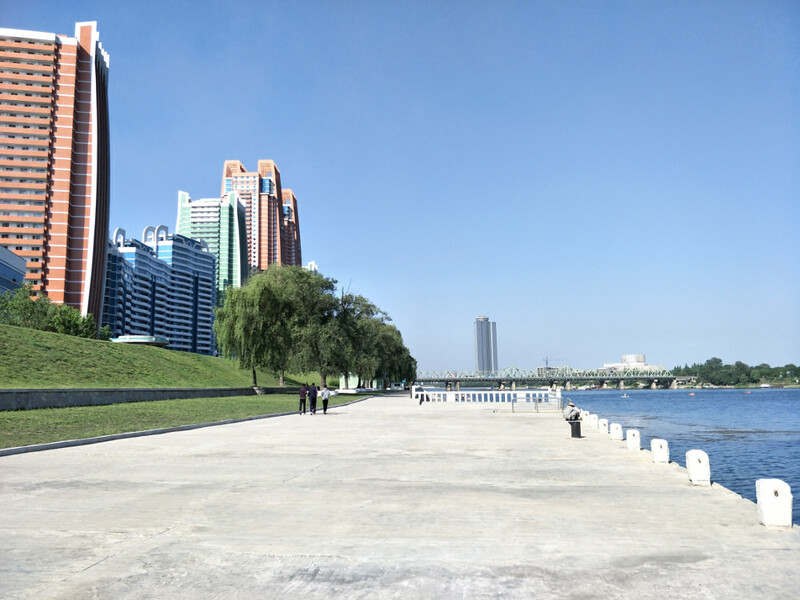 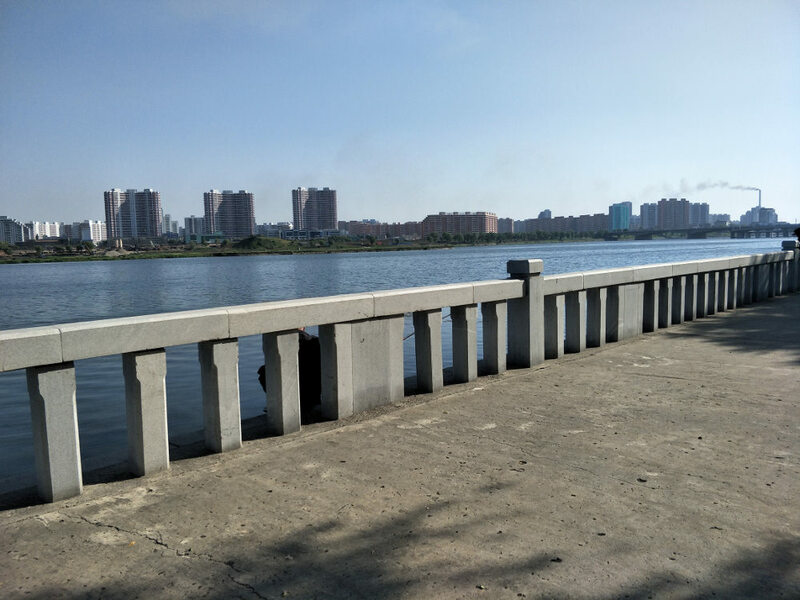 I decided to take a short detour and check out the area along the banks of the Taedong River just beside Mirae Scientist’s Street and across the river from Tongil Street. 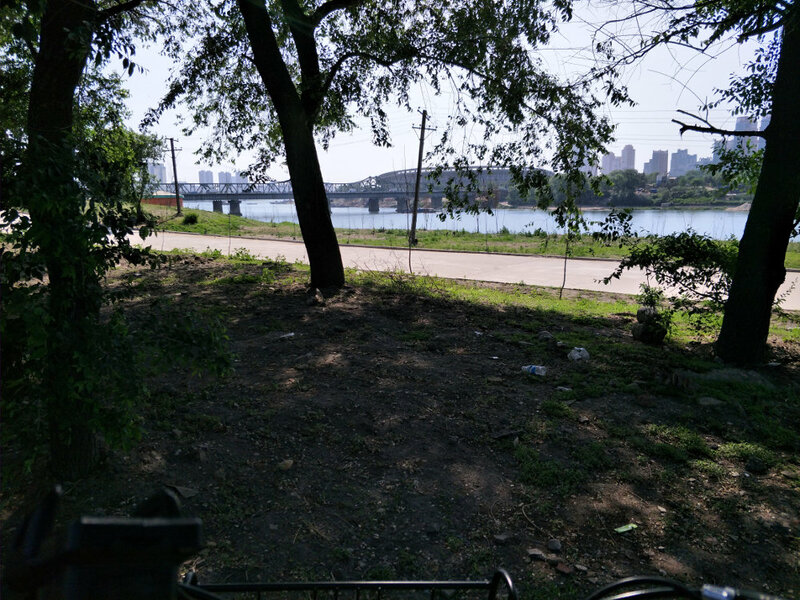 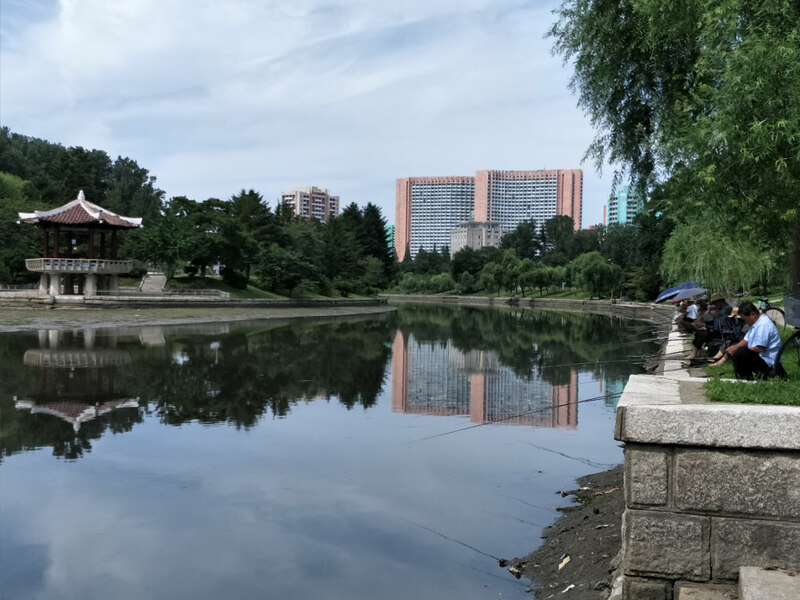 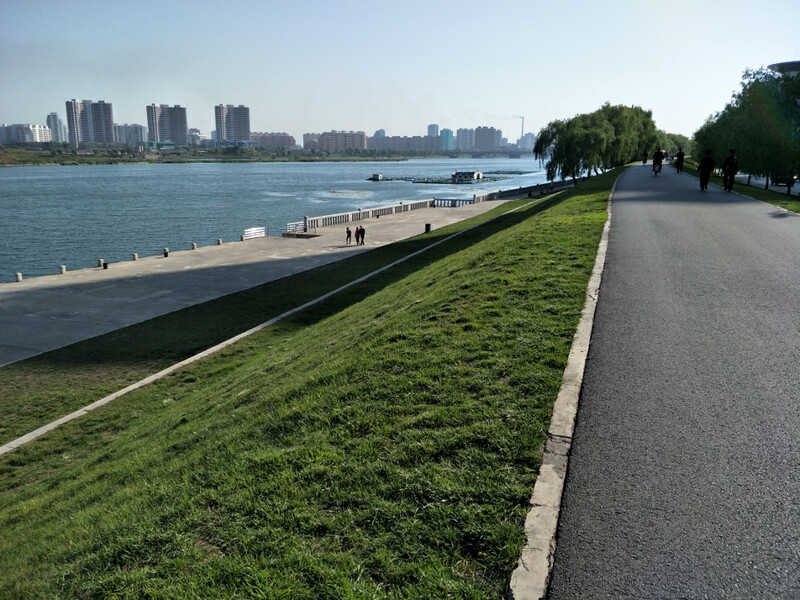 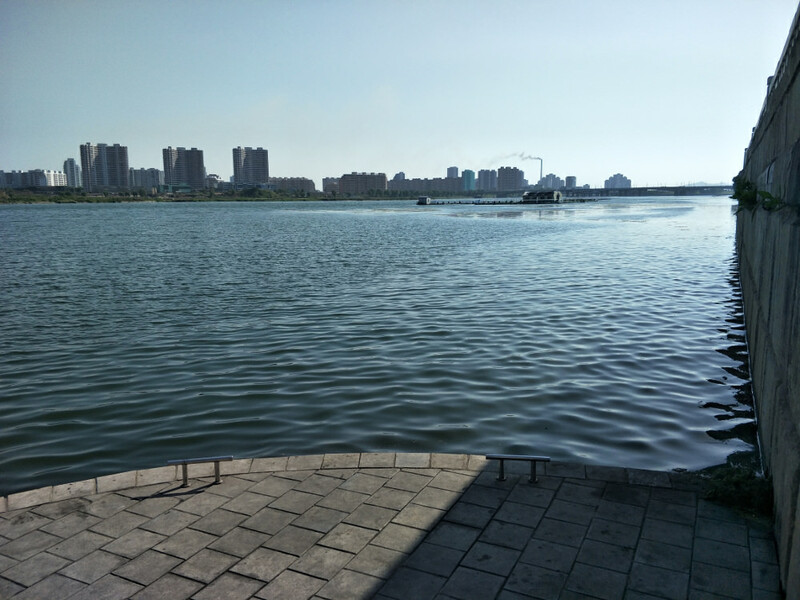 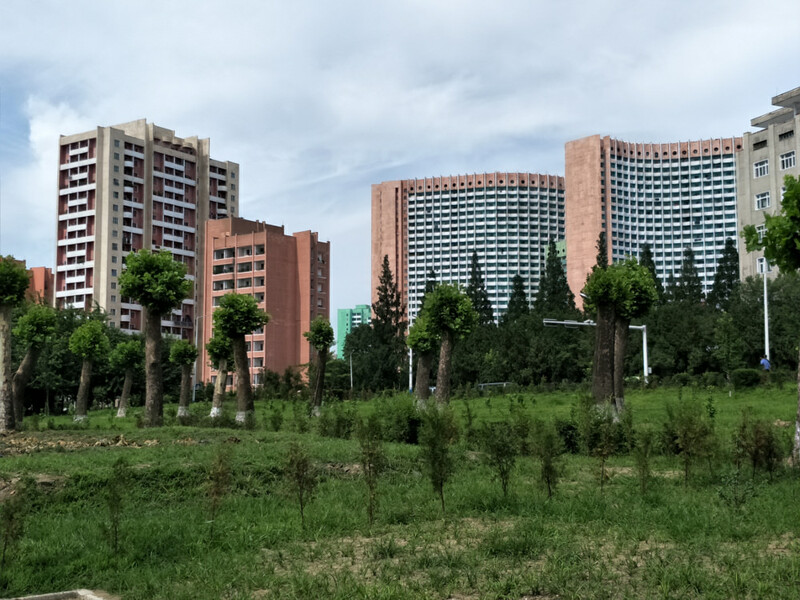 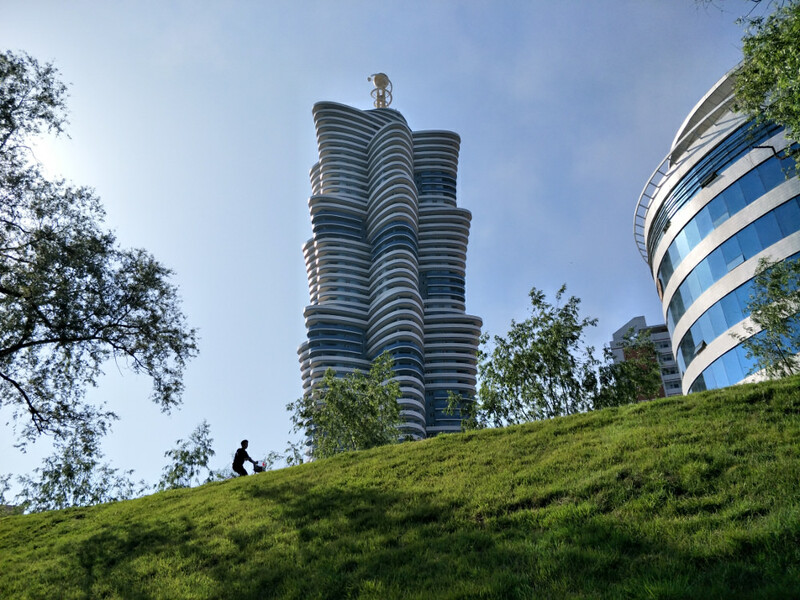 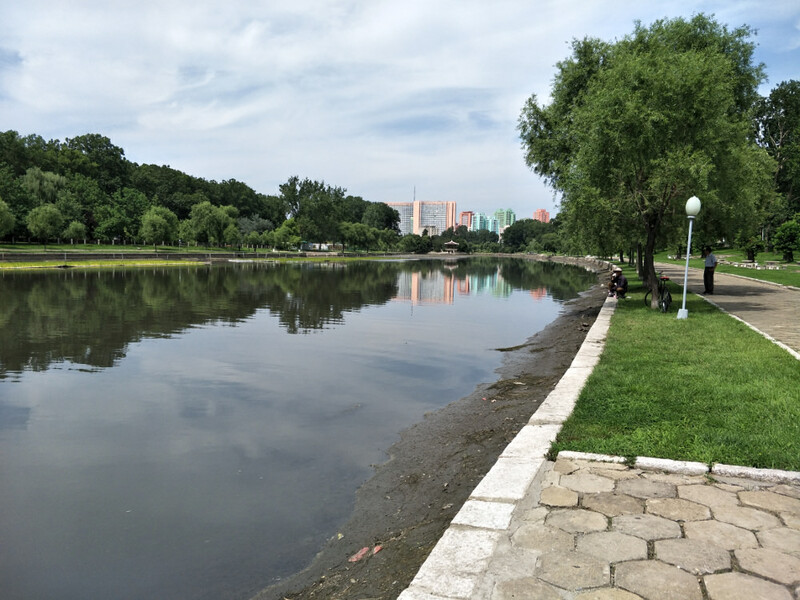 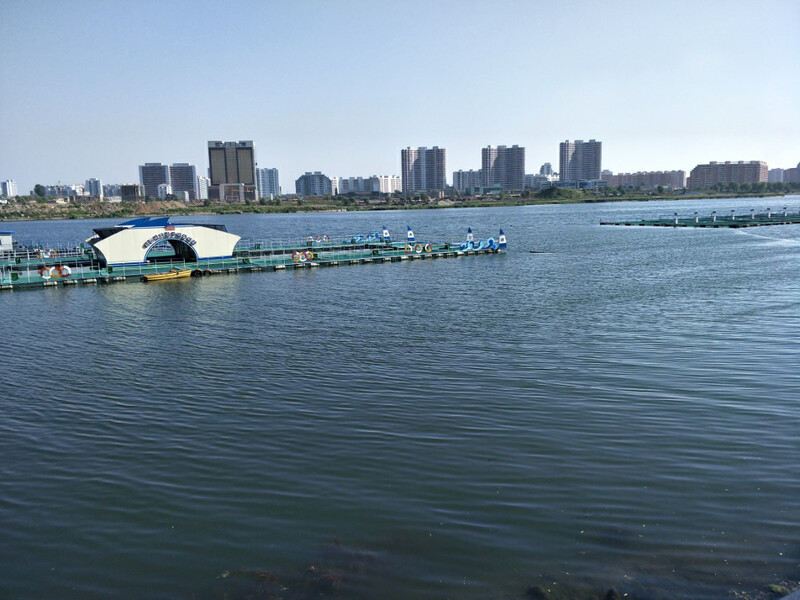 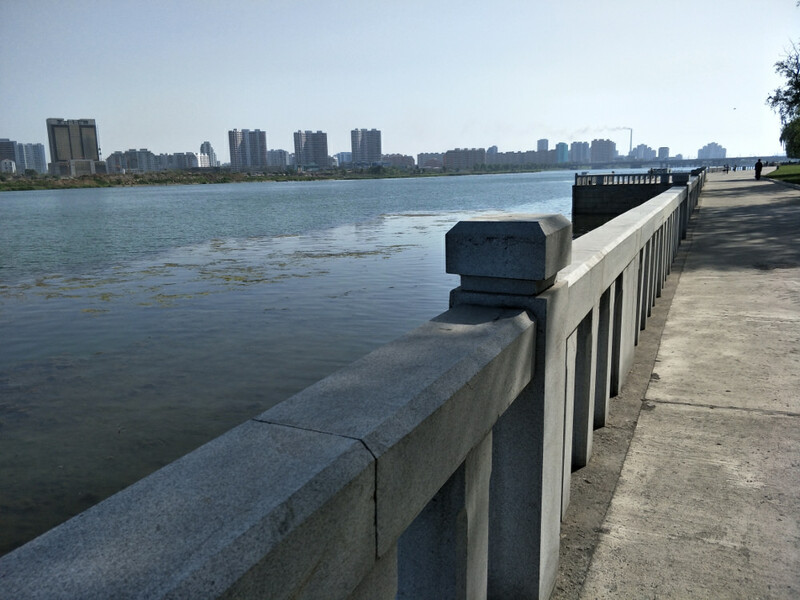 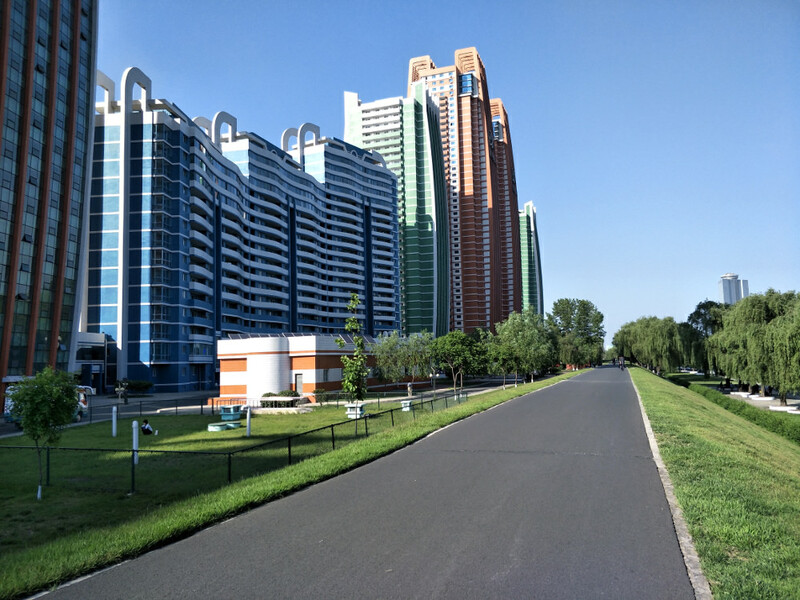 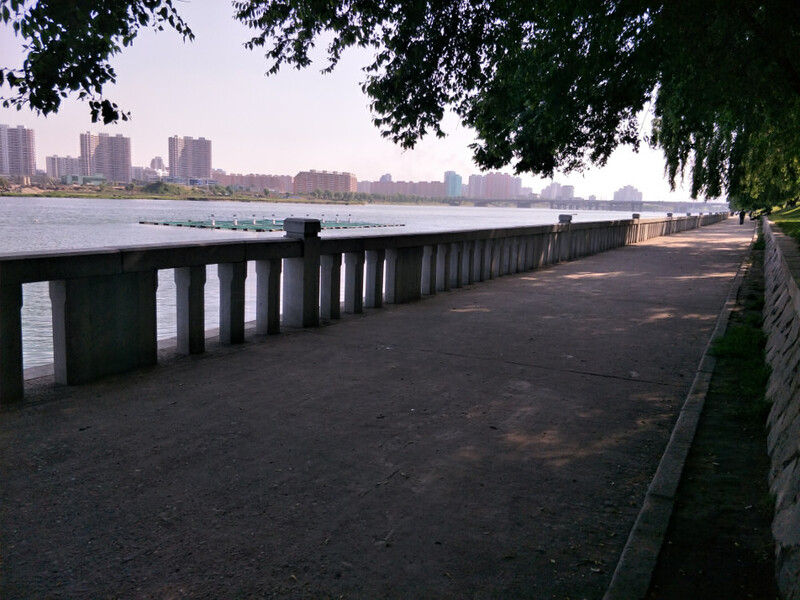 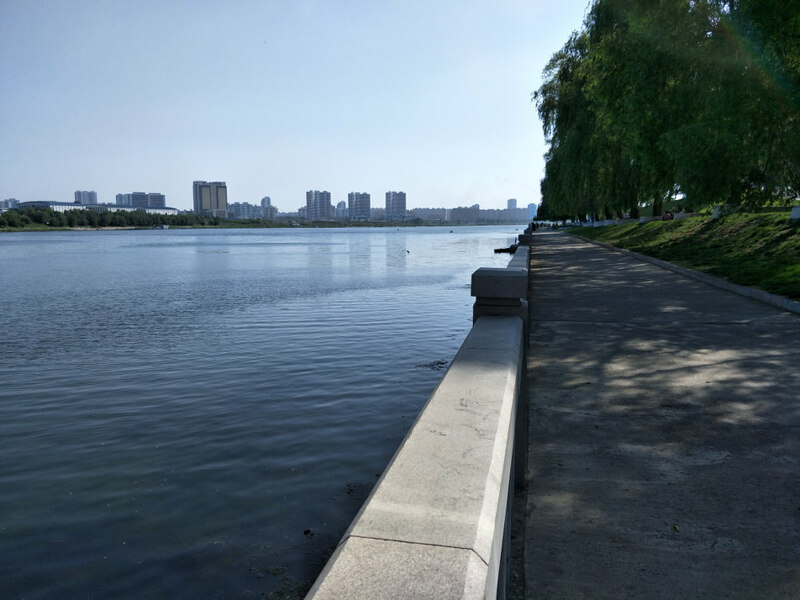 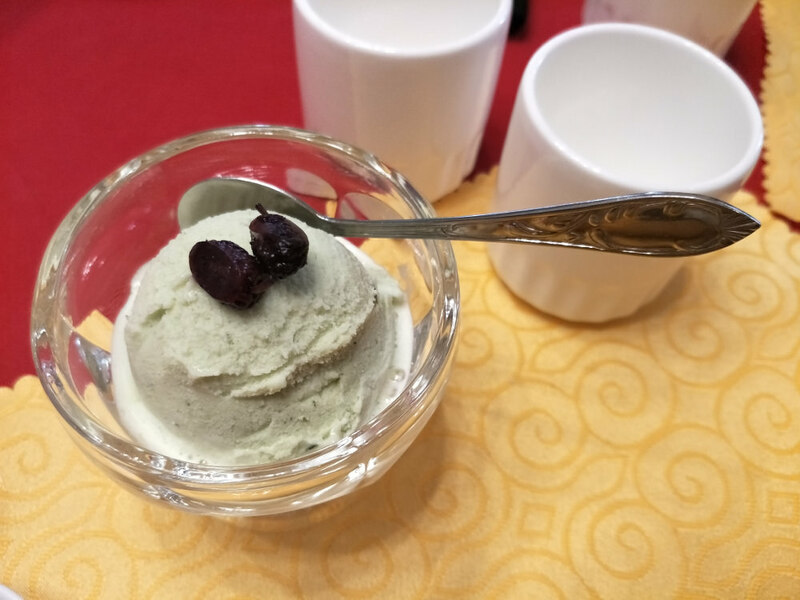 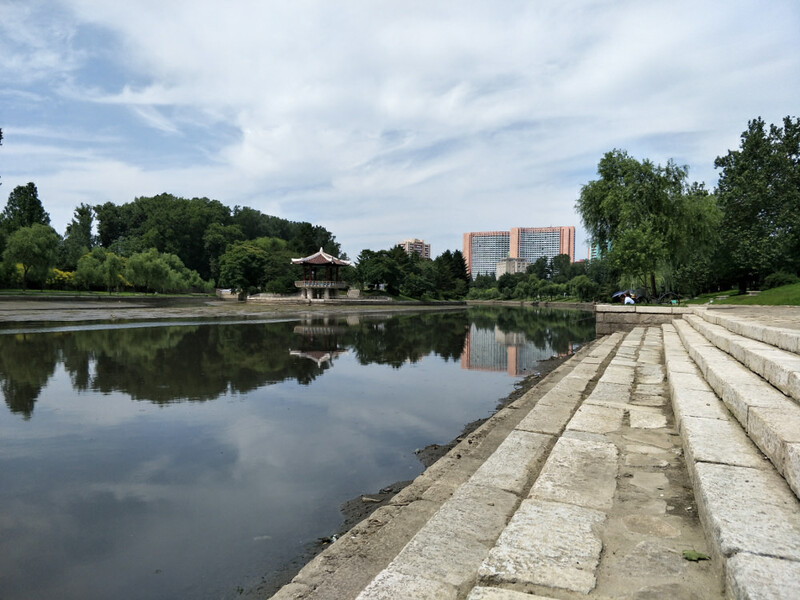 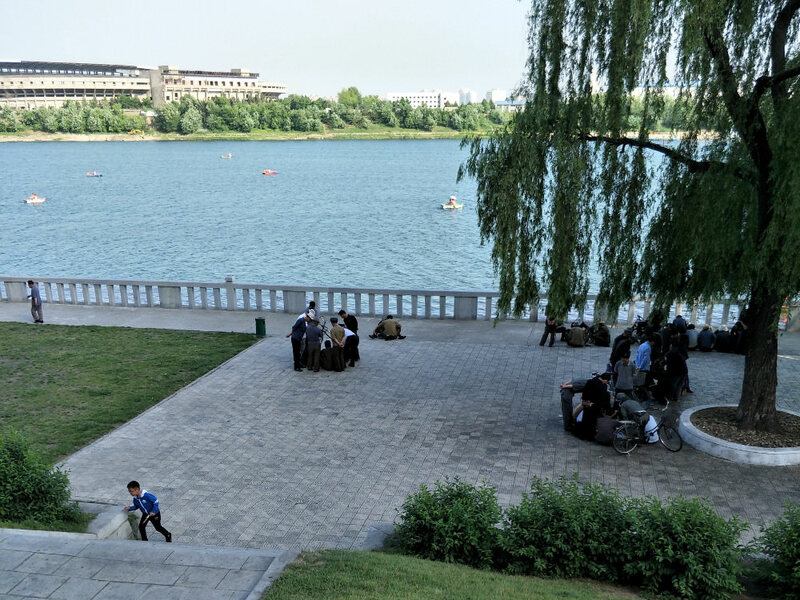 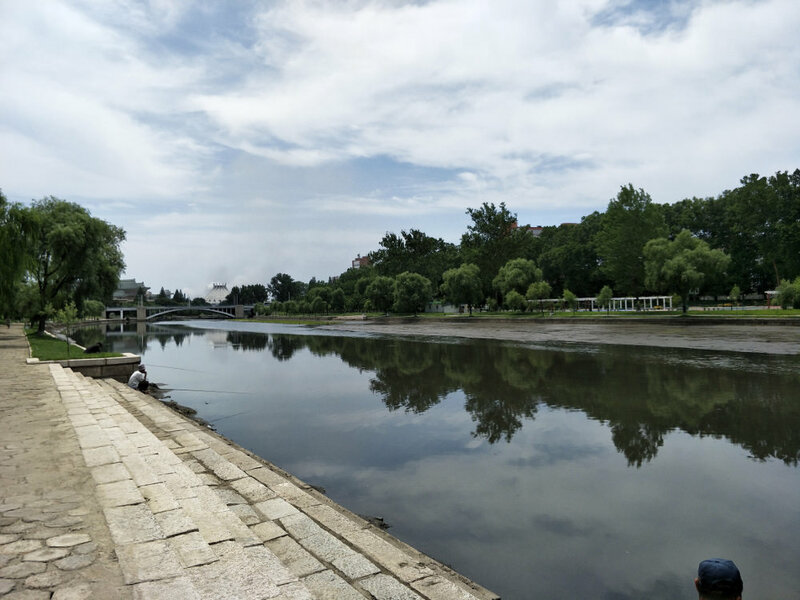 It turned out to be a really nice spot, with good views of Mirae Scientist’s Street, Tongil Street, and the Taedong River, and plenty of weeping willow trees to provide shade from the strong sun on that day. 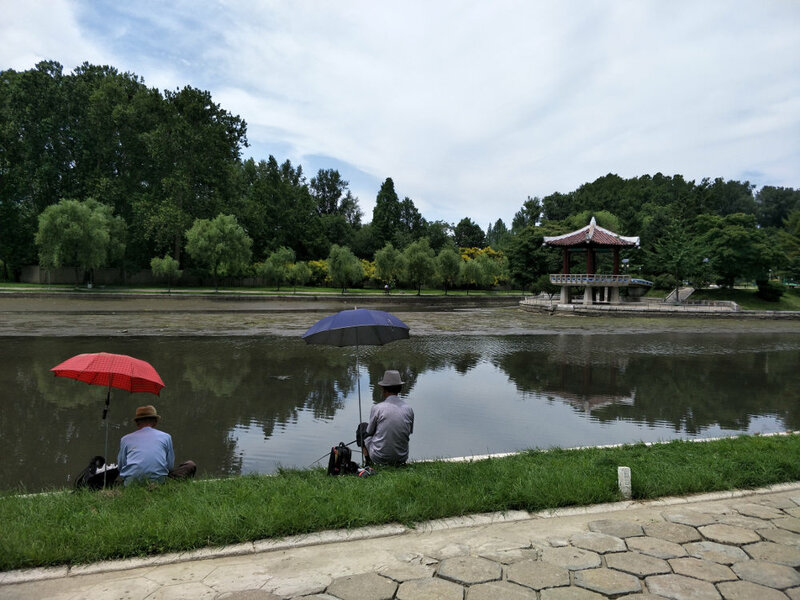 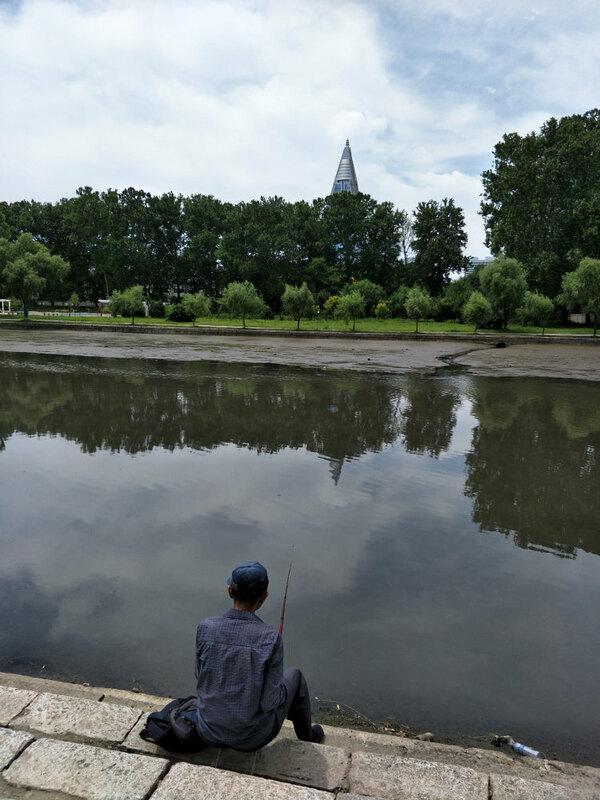 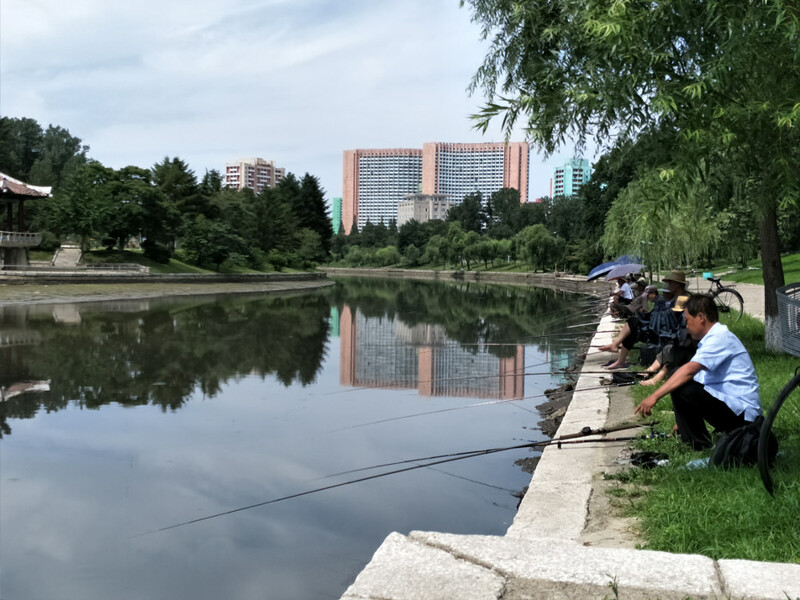 There were quite a few people out relaxing, including not a few old men who were fishing and playing Korean chess (these seem to be the default pastimes of retired men in North Korea). 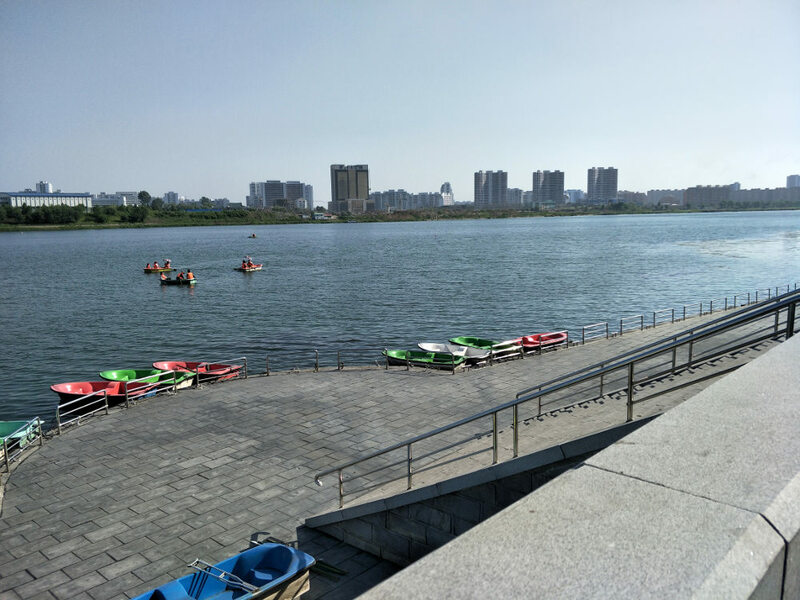 There was a place where you could hire boats and go rowing along the river, which a few people were doing. 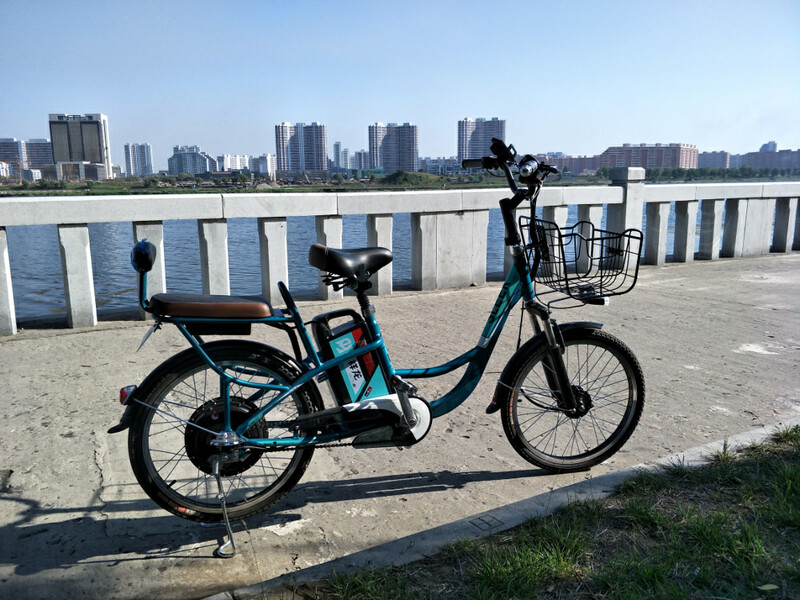 Upon visiting this place I was glad to have my bike. 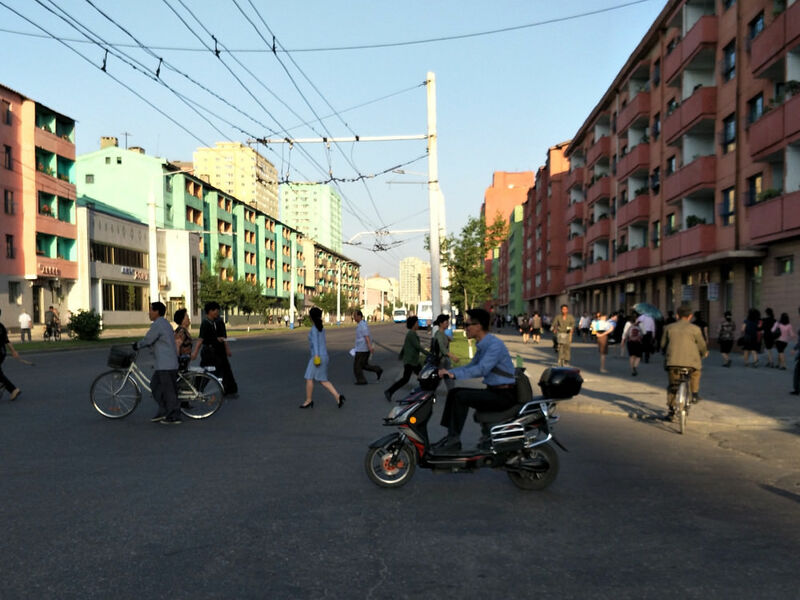 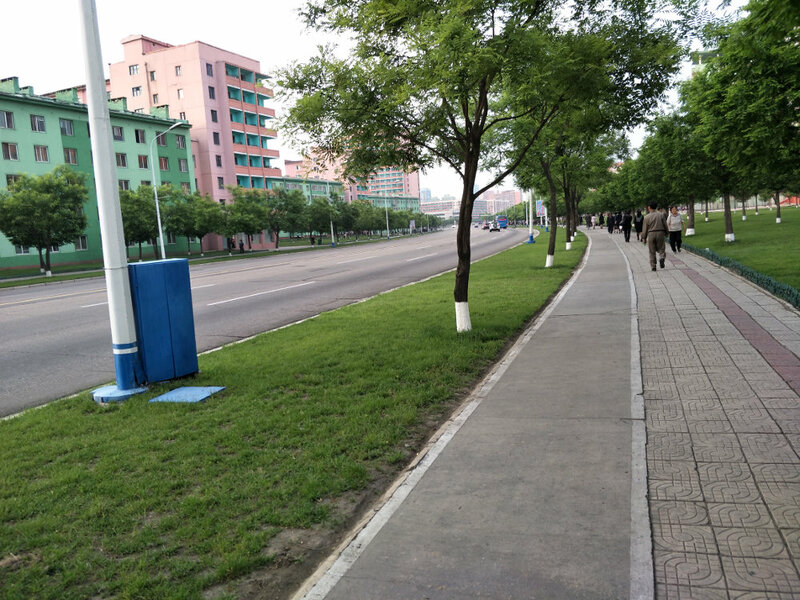 Mirae Scientist’s Street is essentially the other side of town entirely from Kim Il Sung University and the Foreign Student Dormitory, and other than the subway or a $10 USD taxi ride it would be hard to reach. 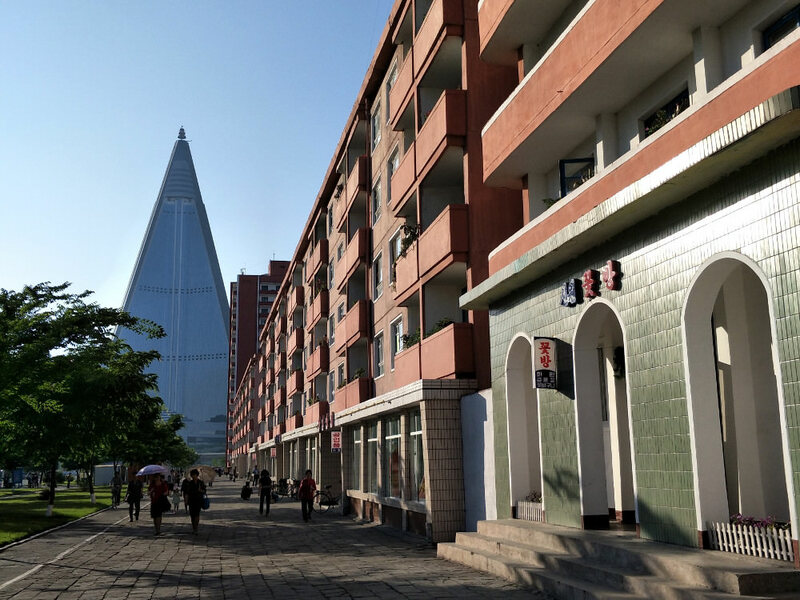 On the way back home, I passed the area near Potong Gate and the Ryugyong Hotel. 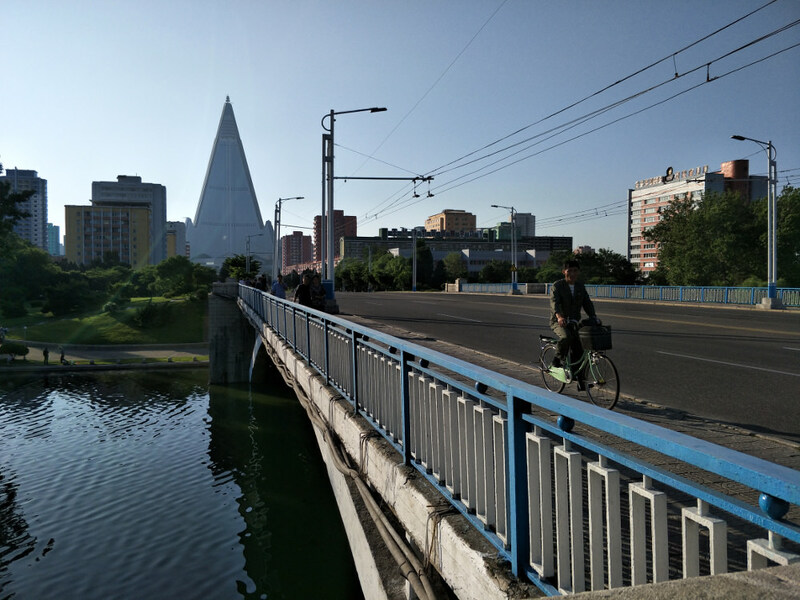 I was almost home when I decided to take a slight detour in Sosong District. 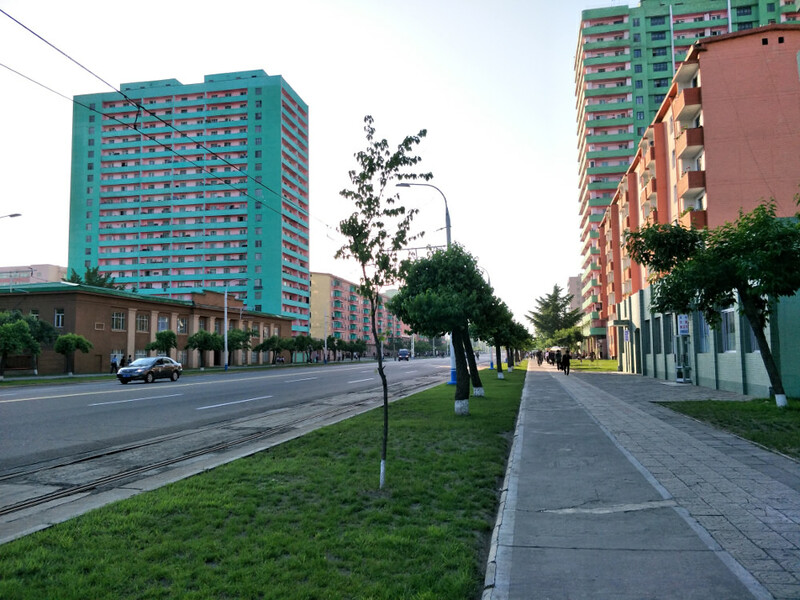 I ended up in a neighborhood I’d never set foot in that was near the edge of the city. 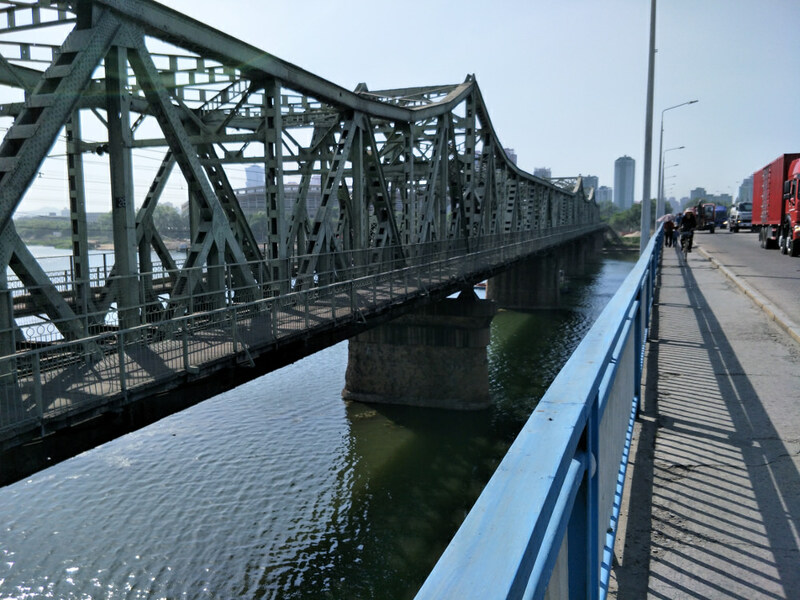 I wondered how many foreigners this area gets passing through– probably not many. 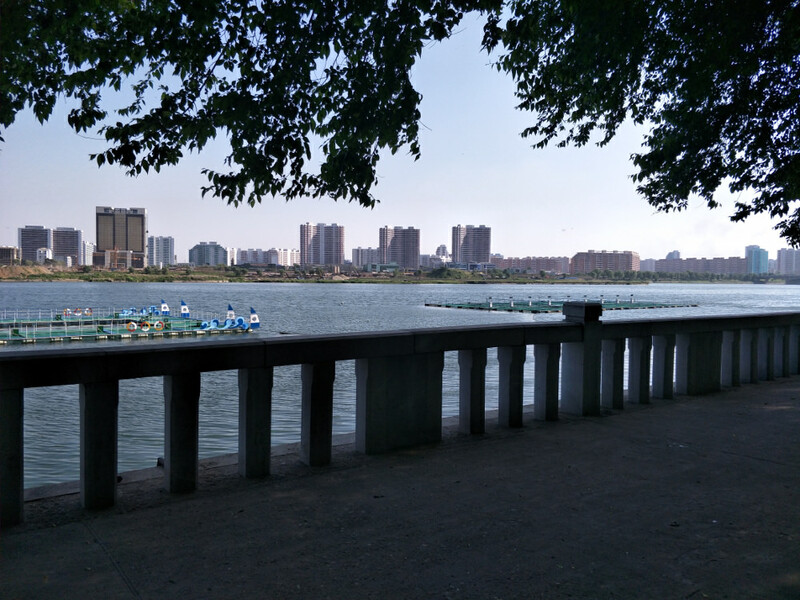 After finally returning home, I realised this cycle had been the single most epic I had yet undertaken. 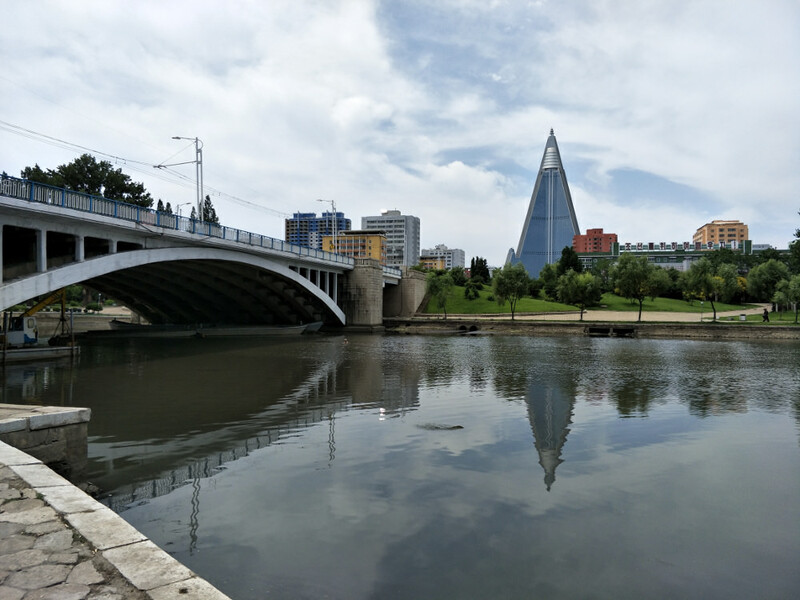 I had drawn a ring around a large swathe of downtown Pyongyang. 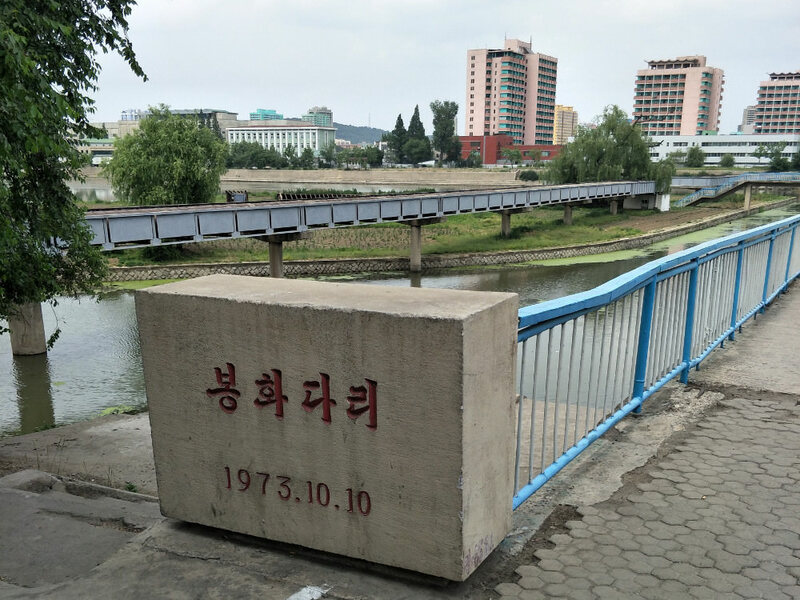 I had just about gone from one end of the city to the other– from its northern edge at Ryomyong Street almost to Tongil Street at its very south. 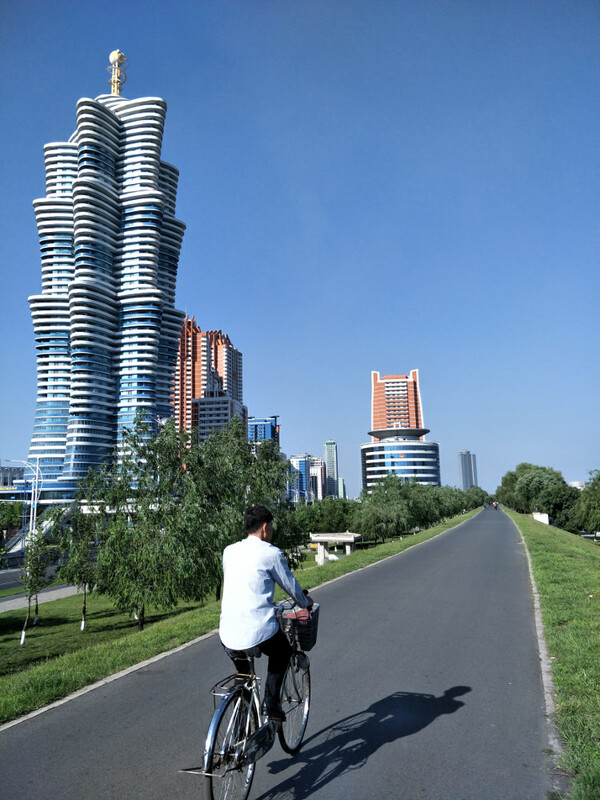 Cycling or driving across Pyongyang, one does realise it’s quite a small city. 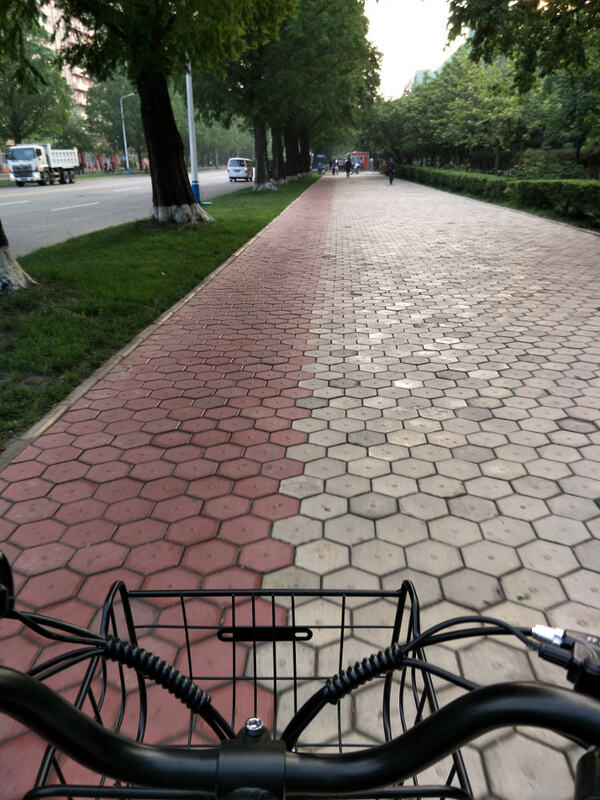 You can cycle from one end to another in about two hours. 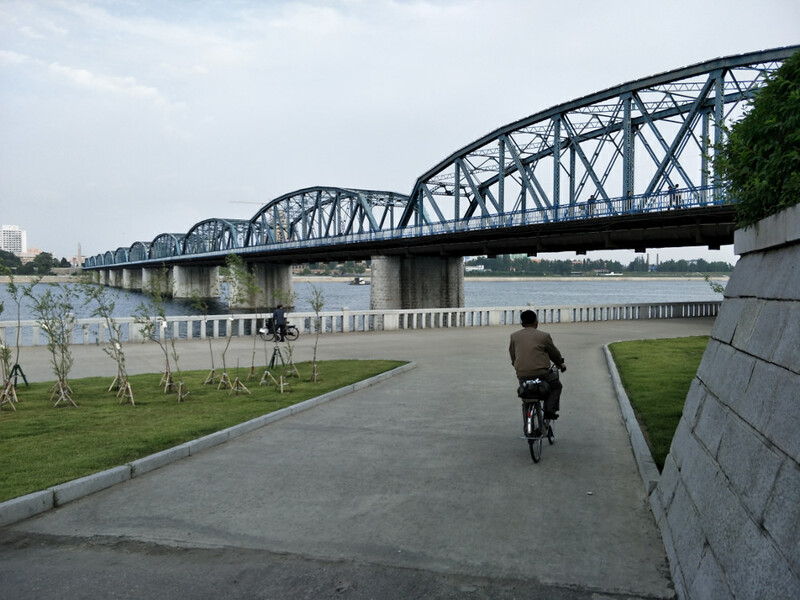 Another memorable bicycle trip I did was from the dormitory to Kwangbok Street, which was also essentially a trip from one side of the city to another and back. 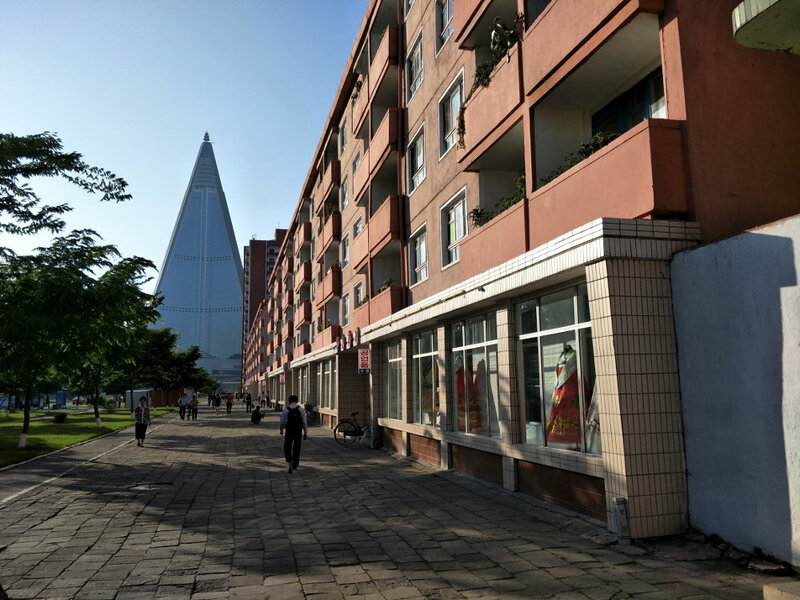 I went in a straight line down Ryomyong (“dawn”) Street, which ended in Pipa Street, then Hyokshin (“innovation”) Street, where I passed the Ryugyong Hotel from the back, next onto Rakwon (“paradise”) Street, and then after merging into the end of Pulgun (“red”) Street, I reached my destination. 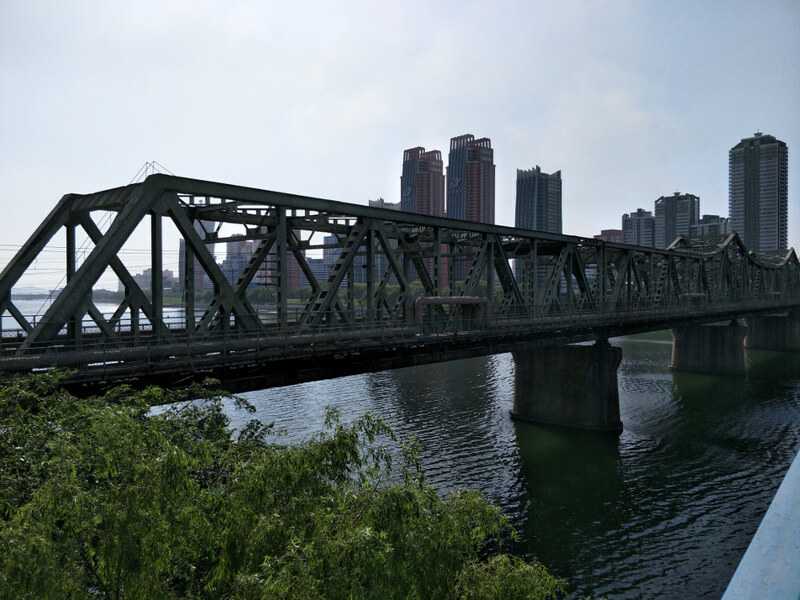 On the way I crossed Ponghwa (“torch”) Bridge. 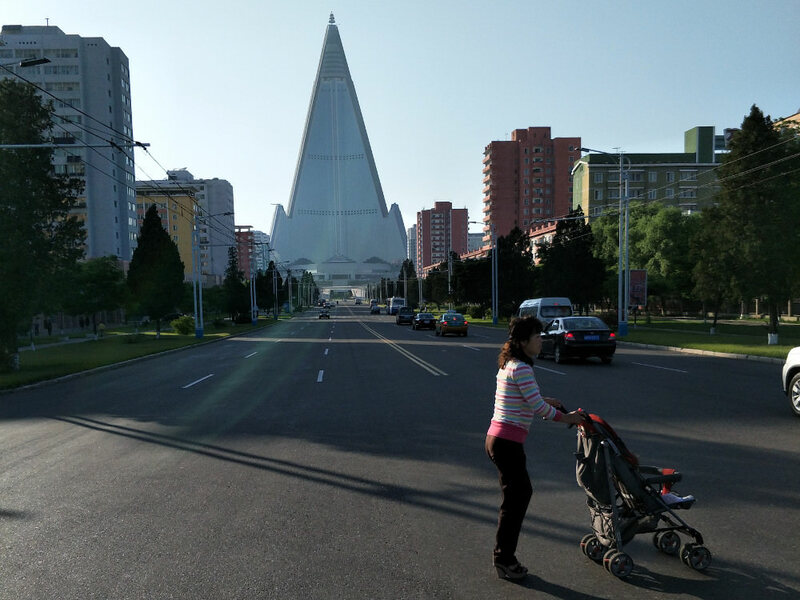 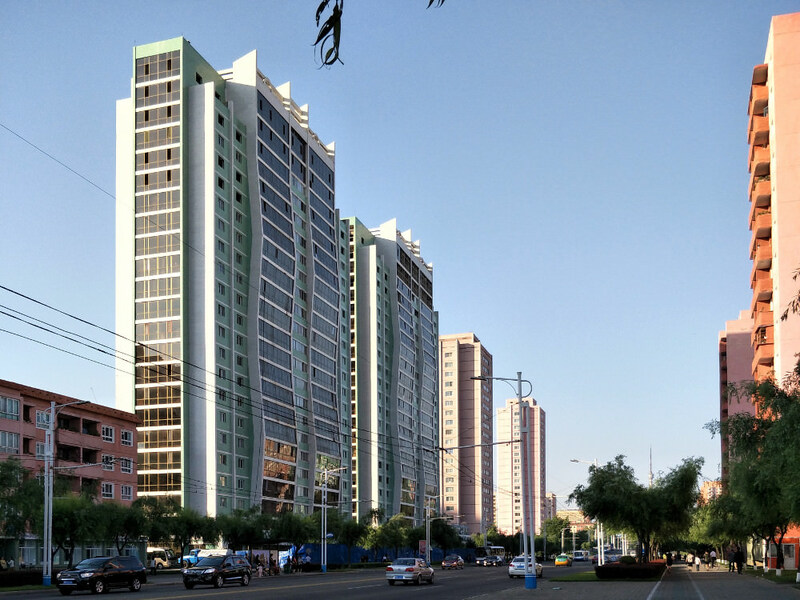 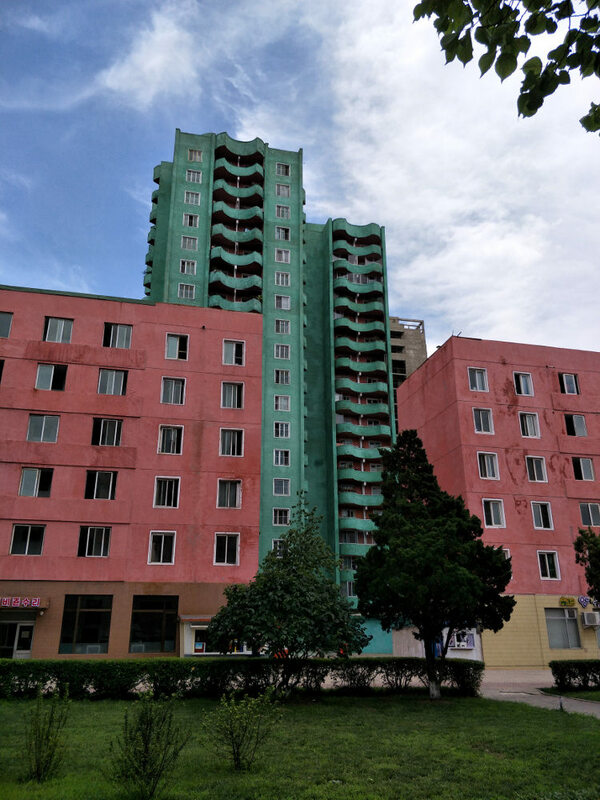 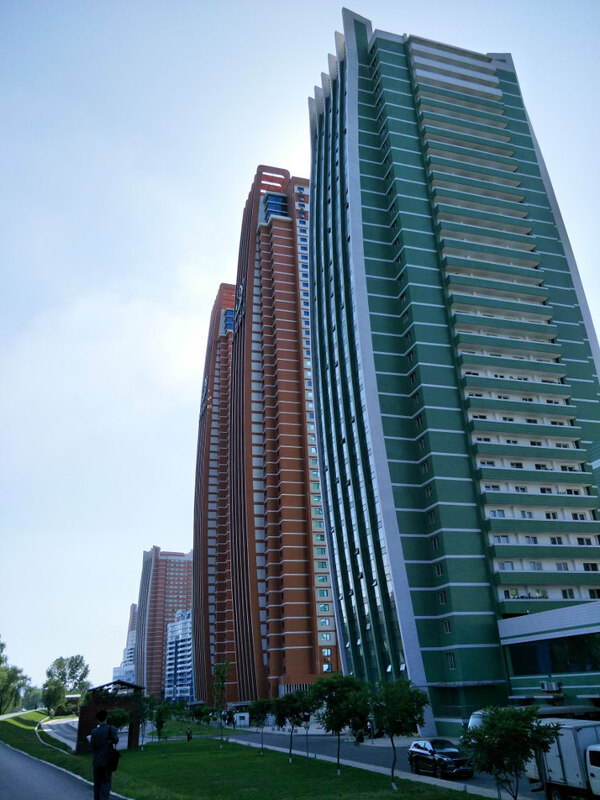 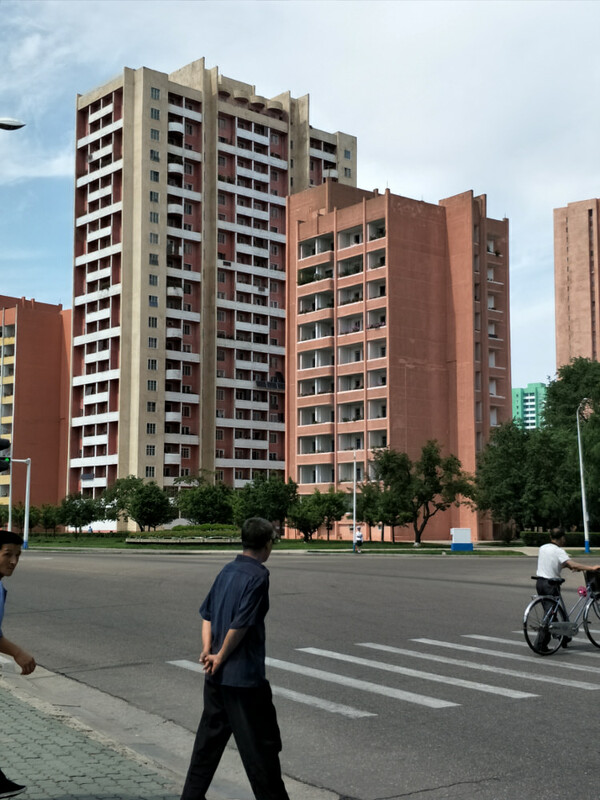 In Pyongyang, ideology imprints itself not only onto the names of the streets and bridges, but also onto the top of apartment blocks. 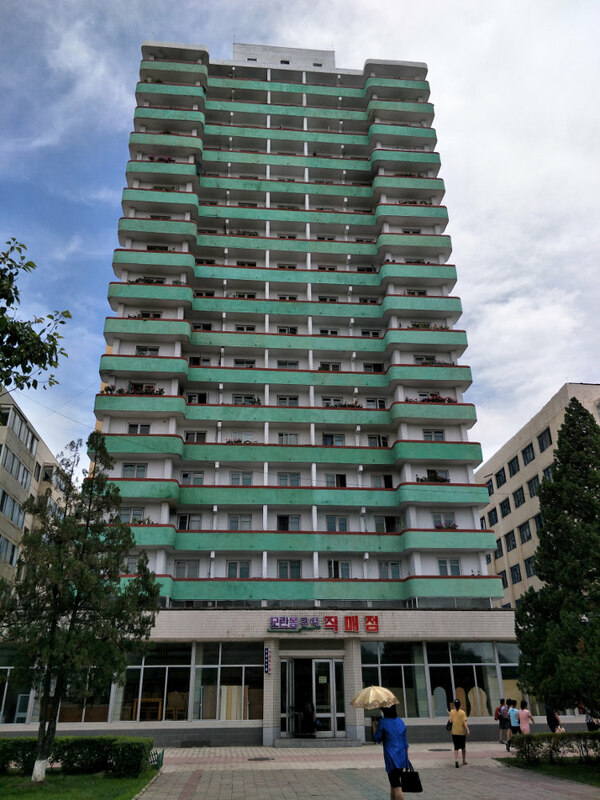 Here is an apartment block on Rakwon (“paradise”) Street. 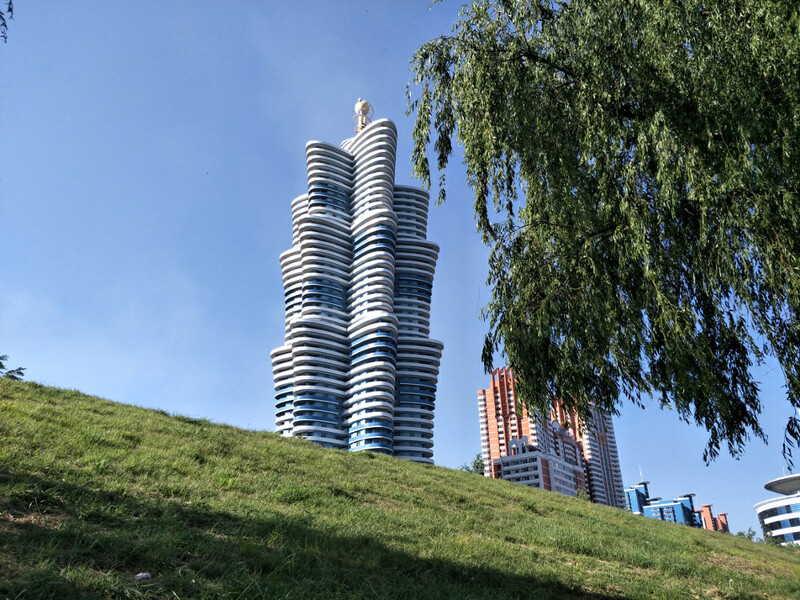 “Do Everything According to Our Style!”, the slogan on the top reads. 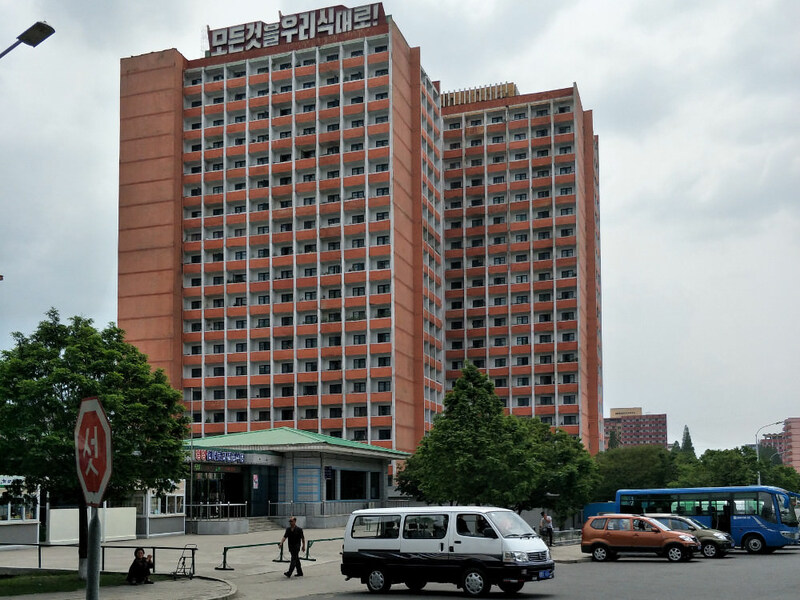 The board containing the text is stylised to look like two red flags fluttering side by side, and comes with neon sign tubing so that it can be lit up at night. 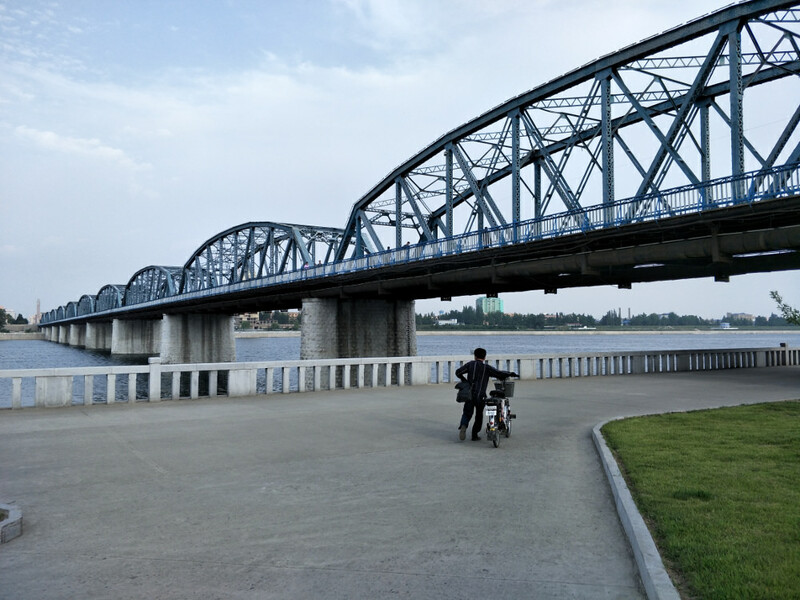 And here are photos from one last cycling trip. 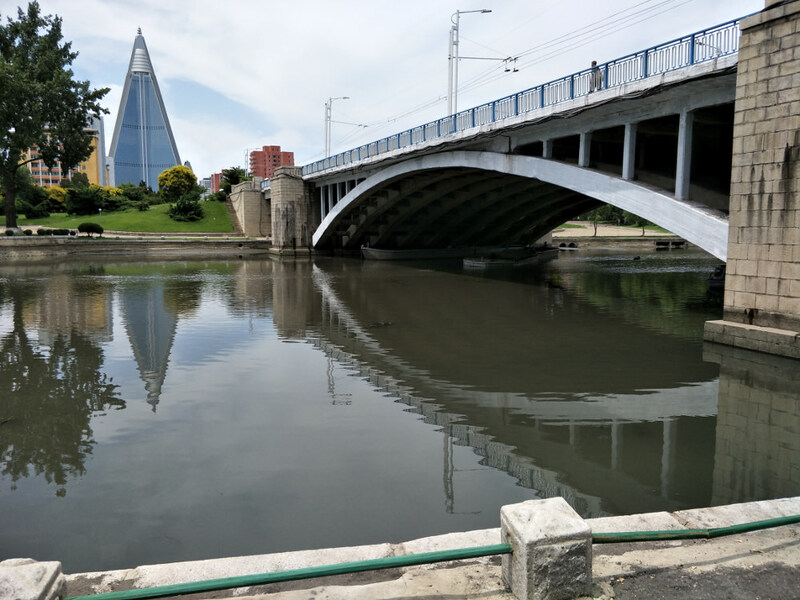 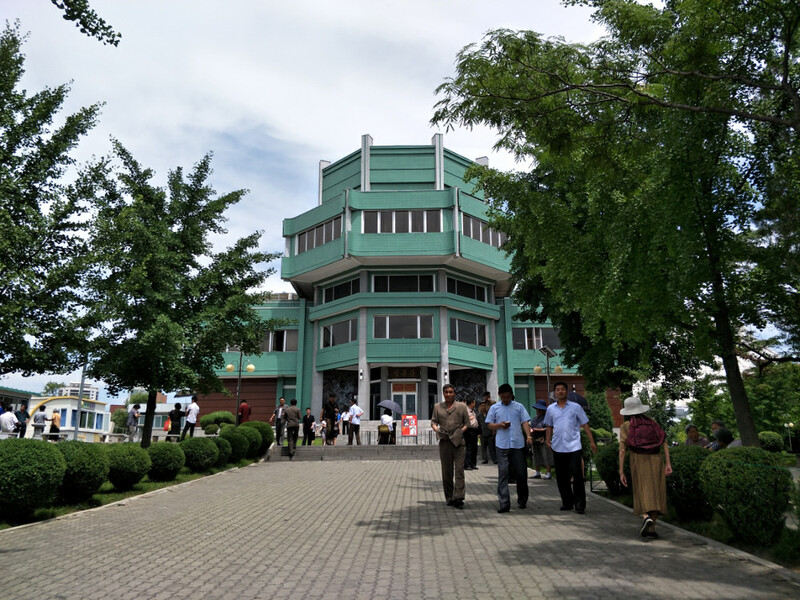 This one was to Chongryu Restaurant on the Potong River to meet the 2018 Pyongyang Summer Language Program tour group for lunch. 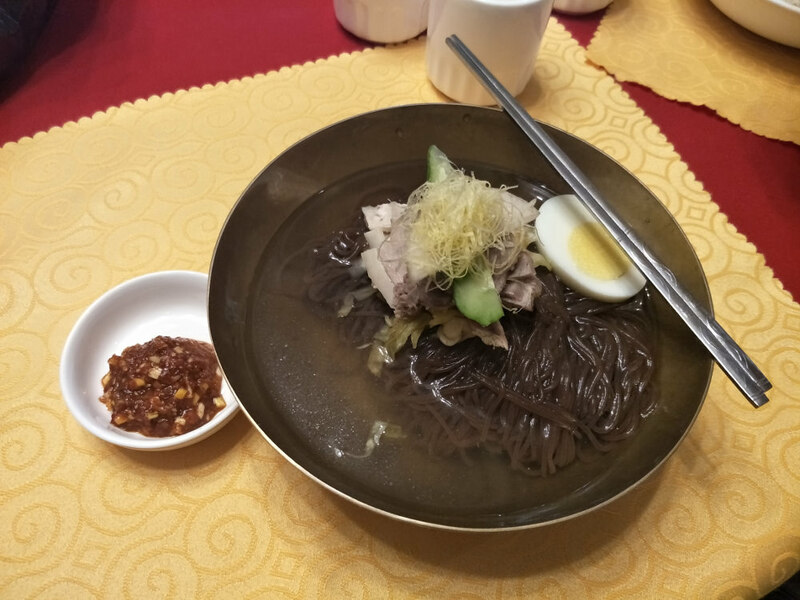 Chongryu Restaurant is the second most well-known Pyongyang cold noodle specialty restaurant after Okryugwan, and I hadn’t yet had a chance to visit so was quite looking forward it. 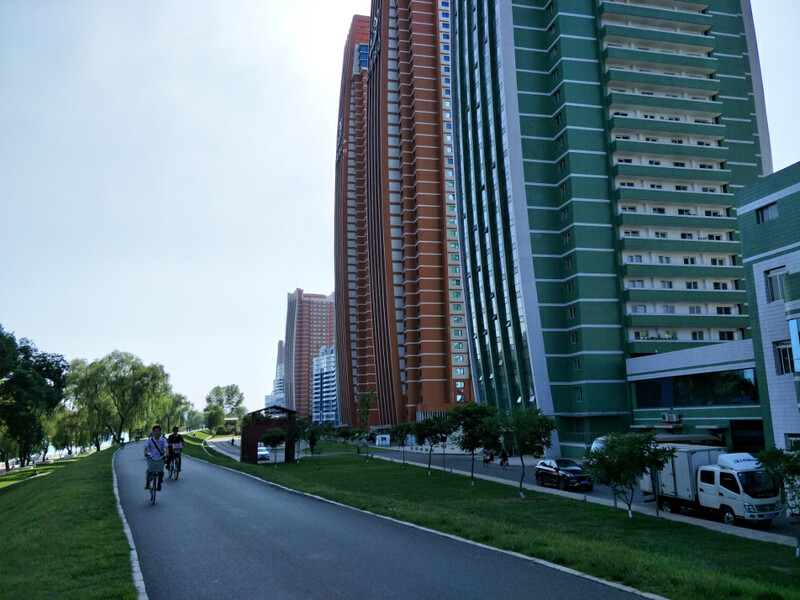 The way there also took me past Puksae, which has some really interesting apartment design, and then down the Potong River on a nice summer day. 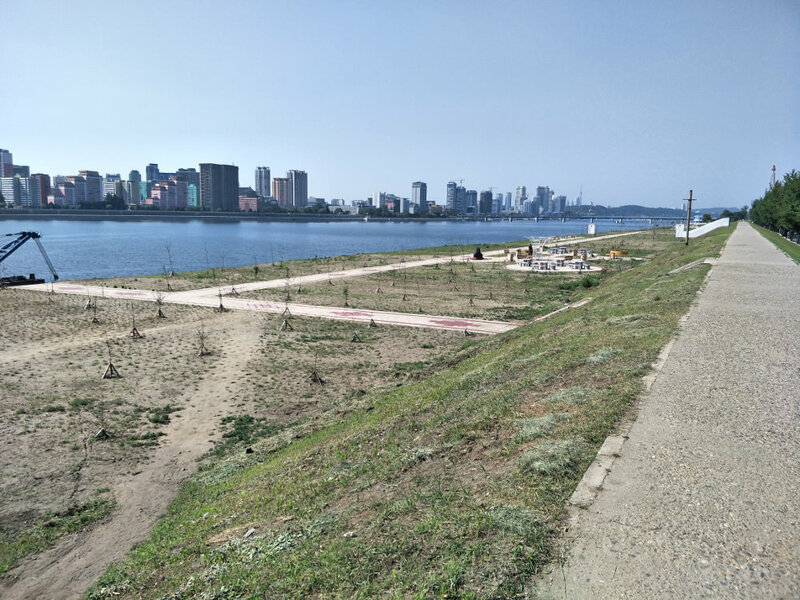 Well that’s it for now. 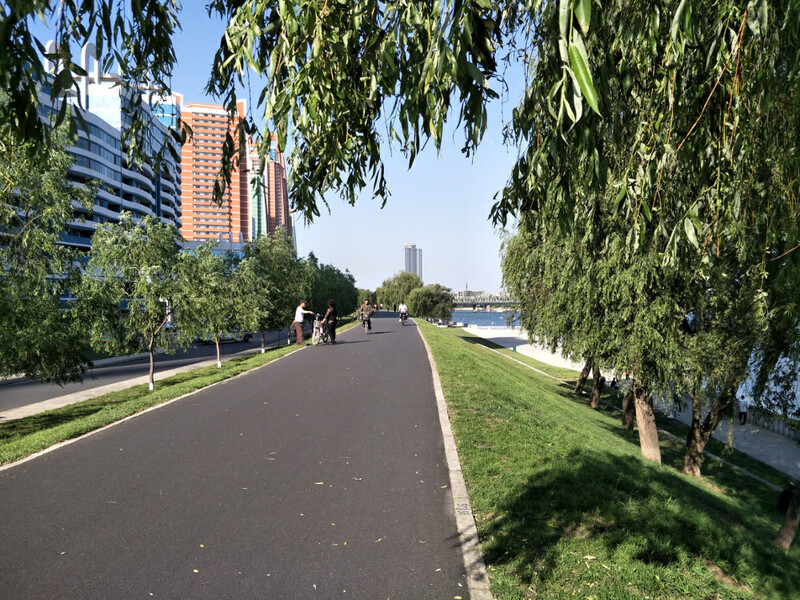 But I’ll be back with more cycling adventures next semester!